This is a Field Disassembly article, which means that only the defining characteristics of the BMP-1 will be examined in detail. We will not be exploring the armour protection and mobility of this vehicle in much detail except for its significance in a historical context, as the technical details have already been covered in Tankograd's BMP-2 article. The development of the BMP-1 is tightly linked to the development of the T-64. In the mid-50's, requirements for a prospective new medium tank were drawn up, and in doing so, it was realized that existing armoured personnel carriers would be left behind during fast-paced offensive maneuvers if the new machine was realized. Closer cooperation between tanks and infantry was seen as a mandatory requirement under the new vision of mechanized warfare for the survival of both the tank forces and the infantry. The new armoured personnel carrier would also need to be capable of fighting without an attached tank unit. As a result, a parallel project took place to introduce a new armoured personnel carrier with not only enhanced mobility, but also enhanced firepower. The requirements for the Red Army's new armoured personnel carrier were drawn up in the late 50's and a competition was launched. 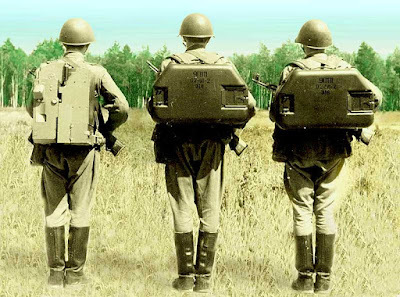 Among the participants were the design bureaus from Chelyabinsk, Kurgan and Volgograd (the Volgograd design bureau would go on to invent the BMD series of paratrooper IFVs). Most of the competing designs were already built in metal and ready to participate by 1961. Most of these prototypical designs incorporated a water jet, and many of them used the ones from the PT-76, including the 8x8 Object 1200 and fully tracked Object 914. The comparative trials took place in Rzhevka and Kubinka (the same Kubinka that now hosts the famous Kubinka Tank Museum). 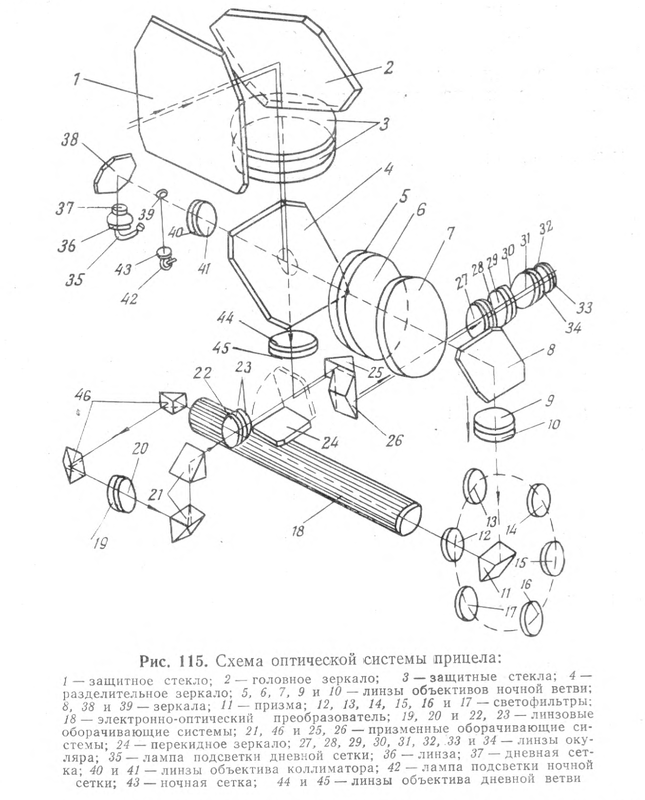 In 1965, Object. 765 won the competition, but when it came time for it to enter the Red Army, its long term viability came into question due to its high cost. It was debated whether or not it offered enough advantages over the much cheaper BTR-60 wheeled armoured transport. A common internet-spread argument is that the BMP was favoured as it was protected from NBC threats while APCs like the BTR-60 were not, but this is not a valid point. 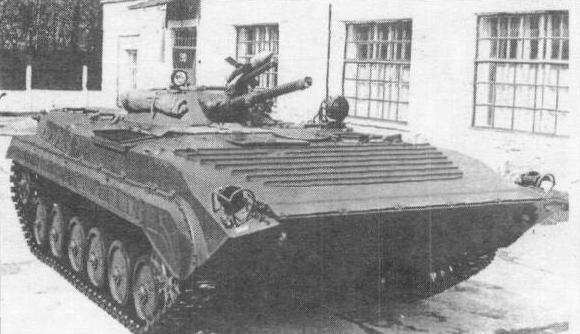 A version of the BTR-60 that had NBC protection was already in development at the time. This version would become the BTR-60PB, a mainstay of Soviet motor rifle divisions. The BMP entered service in 1966 and it was decided that only the units in close proximity to NATO forces in Europe would be equipped with the BMP. Second line and reserve units would have to remain contented with the BTR-60PB which also entered service in 1966. Suffice to say, this situation did not last. 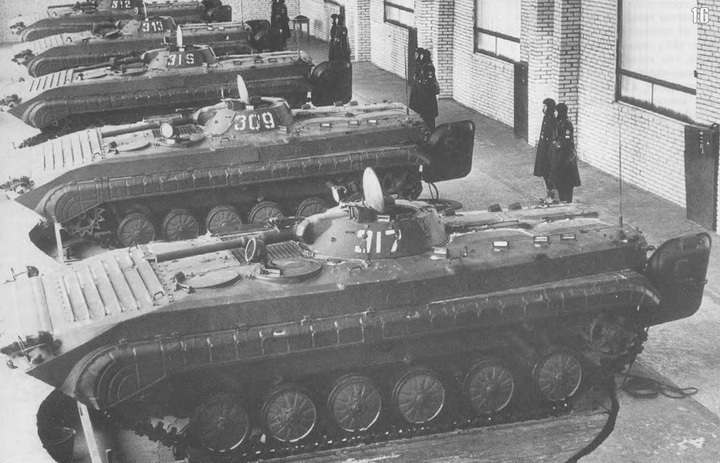 In the end, the BMP turned out to be the most mass produced IFV in human history, with about 40,000 samples produced by the time production ended in the USSR in 1983. 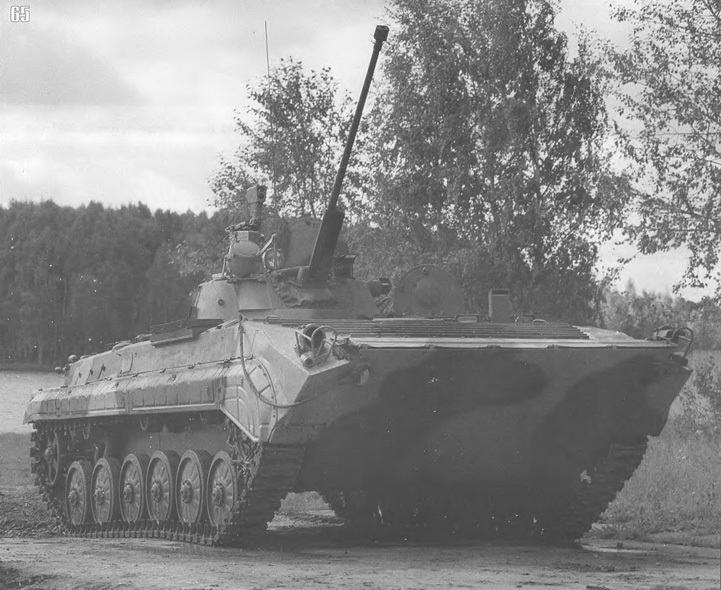 At the time of its introduction, the BMP was unusual in the Red Army - not because it was a tracked APC, but because it was tracked but not steered by tillers, as was the case with the MT-LB and the BTR-50. This marked the progressiveness of the BMP in the international arena as well, as APCs like the British FV432, American M113, French AMX-10P and German Spz. 12-3 were all steered with tillers. The BMP, on the other hand, had a T-bar steering system with excellent hydraulic powered steering assist. This was just one of several reasons why the BMP was considered revolutionary for its time. Another reason was the new tactics developed for the new vehicle: while typical armoured personnel carriers were used in frontline assaults as infantry carriers, their light armament made them unsuitable for fighting alongside (or behind) tanks and they were limited in scope. This changed with the BMP, which was intended to advance towards enemy lines alongside tanks in newly developed shock formations. The BMP could fire on short halts to eliminate entrenched enemy targets and machine gun positions in support of dismounted infantry who would be responsible for neutralizing enemy infantry with their own small arms. It was also possible for the infantry to fight while still riding inside the BMP, but that was already possible in previous BTR designs and cannot be considered a feature that was exclusive to the BMP. 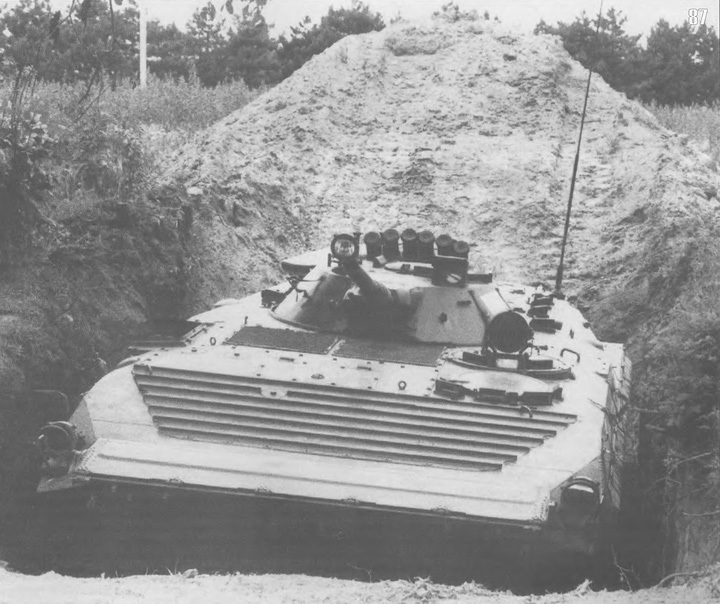 Rather, the innovation of the BMP-1 was that it incorporated firing ports that would have allowed the passengers to fire at the enemy while remaining protected from small arms fire even in NBC-contaminated environments. The BTR-60PB also had firing ports, but these were much simpler circular portholes along the sides of the passenger compartment that did not preserve an NBC seal when opened. Although the usefulness of firing ports in modern wars has been put into question, there was good evidence at the time that this feature would have proved effective at suppressing enemy infantry. The effect was that it would reduce the vulnerability of the host vehicle by preventing the enemy from opening fire with anti-tank weapons, and if possible, the enemy would suffer casualties as a result of attempting to open fire. According to the report "Interim Test Report Number 8 - Mechanized Rifle Troop", the amount of damage taken by M113s when used in offensives against dug-in NVA forces decreased drastically when the M113s advanced aggressively and suppressed the enemy with machine gun fire. It is worth noting that in its basic configuration, the M113 has no firing ports and the only available machine gun was a pintle-mounted .50 caliber M2HB with no gun shields. The limitations of the M113 as a modest armoured personnel carrier made it untenable to always use aggressive tactics whenever they were appropriate, but such experiences showed that success was possible. To that end, the BMP-1 has a fully enclosed turret with a 73mm low-pressure cannon, anti-tank missile and a 7.62mm coaxial machine gun, and it had two forward-facing firing ports for PK machine guns and six side-facing firing ports for AK assault rifles, making it ideal for highly aggressive mechanized infantry offensive tactics. Overall, the BMP-1 performed well as an armoured troop carrier and was generally successful in its intended role, but some critics have cited the Yom Kippur war as evidence of the inferiority of the BMP-1 compared to its Western counterparts. The Wikipedia entry on the subject (among other sources) is almost always the source of these accusations, but the evidence given is by no means conclusive - quite the opposite, in fact. Most of the reference materials on the English Internet that mention the BMP-1 and the Yom Kippur war in the same page or paragraph tend to be interpreted incorrectly. Steven Zaloga's report on the performance of the BMP-1 in the Yom Kippur war in his book "BMP Infantry Fighting Vehicle 1967–94" is one of the most often cited and also the most misread. Among other things, he mentions that it is not fair to criticize the BMP-1 for its performance in that particular conflict, as Egyptian and Syrian crews were very hastily trained and had very little familiarity with their vehicle. He writes that Egypt received its first batch of around 80 BMPs between July and August of 1973, and that they were put into service in September. The second batch of around 150 BMPs was delivered between August and September, and were rushed into service by October just before the Yom Kippur war touched off on the 6th of October. That means that aside from a selected number of unit leaders sent to train in the USSR, the majority of Egyptian crews barely had a month to train on their new acquisitions, and some units only had a few weeks to familiarize themselves with them. The Egyptian military also did not conduct any war games that incorporated the BMP-1, so there was no chance for Egyptian commanders to understand the role of the new vehicle and find the best ways to use them in the unique conditions of the Middle East. However, even ignoring the unflattering reputation that came from being associated with the Yom Kippur war, the BMP-1 still had legitimate issues that limited its usefulness in certain situations, and this was revealed in the highly publicized Russian campaign in Afghanistan. Firstly, the cannon could not elevate high enough to strike at nimble Mujahideen light infantry firing down into mountain passes. This drawback was shared by the BTR-60PB and BTR-70 as they also lacked a high-elevation gun turret, but unlike those vehicles, the hull of the BMP-1 was not sturdy enough to withstand powerful anti-tank mines and IEDs. 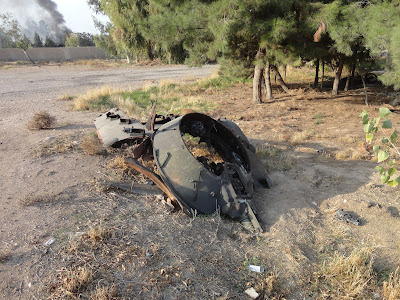 According to a Russian study of Soviet losses in Afghanistan, 40% of BMP-1 mine casualties suffered in Afghanistan required major repairs afterwards. A wheeled BTR was sometimes preferred over a BMP as the typical extent of mine damage would often be limited to the loss of a wheel whereas the chassis of a BMP could potentially suffer structural failure from the blast. 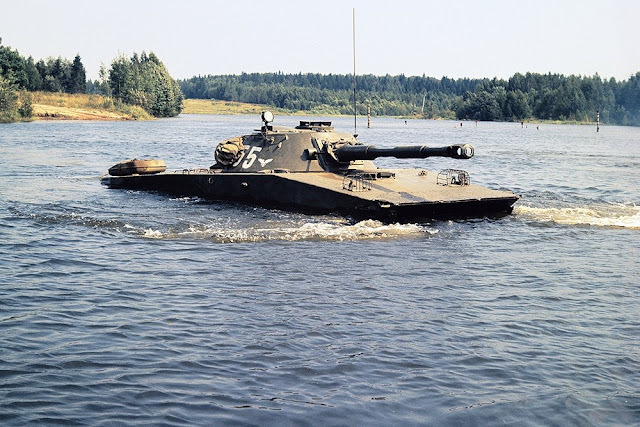 With that said, the basic design of the BMP-1 was still highly successful and it became the chassis and hull has been used as a platform for a variety of specialized vehicles. 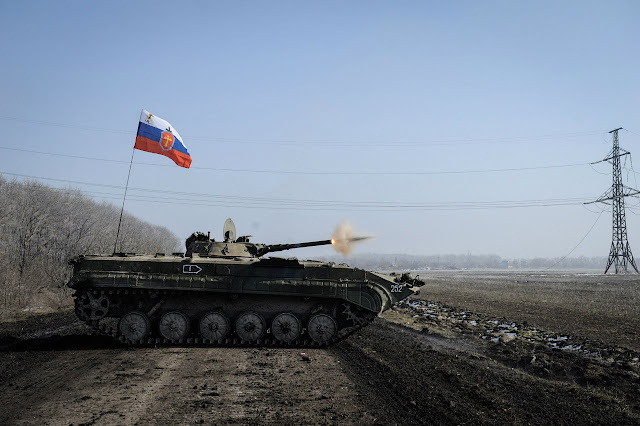 In this article, we will only be examining the five primary variants of the generic BMP-1 IFV. The first iteration of the BMP design is the Object 765 Sp.1 of 1967, also known simply as "BMP", without the "-1". It is characterized by the stubby bow (of the hull). The second variant is the Object 765 Sp.2 of 1969. It is distinguished from the BMP by the more elongated bow. The third variant is the Object 765 Sp.3 of 1973. This was compatible with HE-Frag rounds, but did not have an autoloader. The fourth and final variant is the Object 765 Sp.4 of 1979, better known as the BMP-1P. It is essentially the same as the Object 765 Sp.3 except for the missile system. 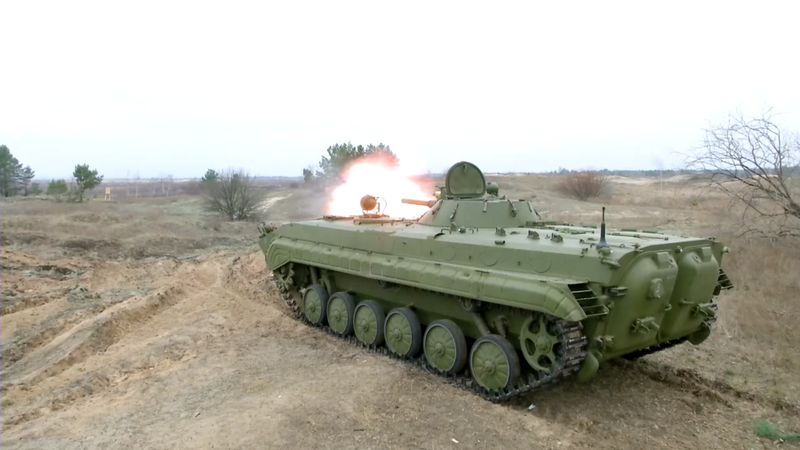 The BMP-1P has an external "Konkurs" missile launcher, as opposed to the "Malyutka" launcher of all previous BMP-1 models. 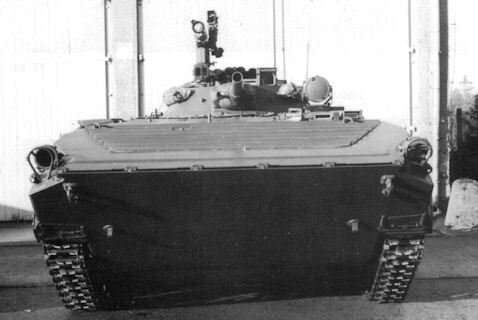 The BMP-1P replaced the BMP-1 on KMZ production lines beginning in 1979, and in the same year, all BMP-1s coming into depots for capital overhauls were modernized to the BMP-1P standard. As the BMP-1 only has a one-man turret, the commander had to be seated in the hull, directly behind the driver. Generally speaking, it does not seem that there was any obvious problem with casemate tank destroyers as far as observation was concerned, and all of the BTR models before and after the introduction of the BMP also had commanders placed in the hull. Indeed, it could be argued that the placement of the commander in the hull was not unusual or problematic for the time, but still, it is necessary to recognize that it is not an ideal arrangement. The most obvious problem stems from the low height of the vehicle. Being so low-slung, it is easy to place the BMP in hull defilade behind bushes, tall grass and soil mounds, but this also prevents the commander from seeing anything from his station. A tank commander is usually located in the turret, if there is one, because a turret offers a taller vantage point for a superior range of vision, and the turret tends to be on the center of gravity of the vehicle, thus making hull oscillations less obvious. This helps improve ride quality and ease of observation. This is one among many reasons why the BRM-1K reconnaissance vehicle based on the BMP-1 has the commander in its two-man turret and not in the hull. Having the commander behind the driver also prevents him from seeing behind the vehicle, so the commander is limited in his ability to direct the driver and he is not able to easily marshal other members of his platoon without exiting his hatch. This issue was recognized and addressed in the BMP-2. 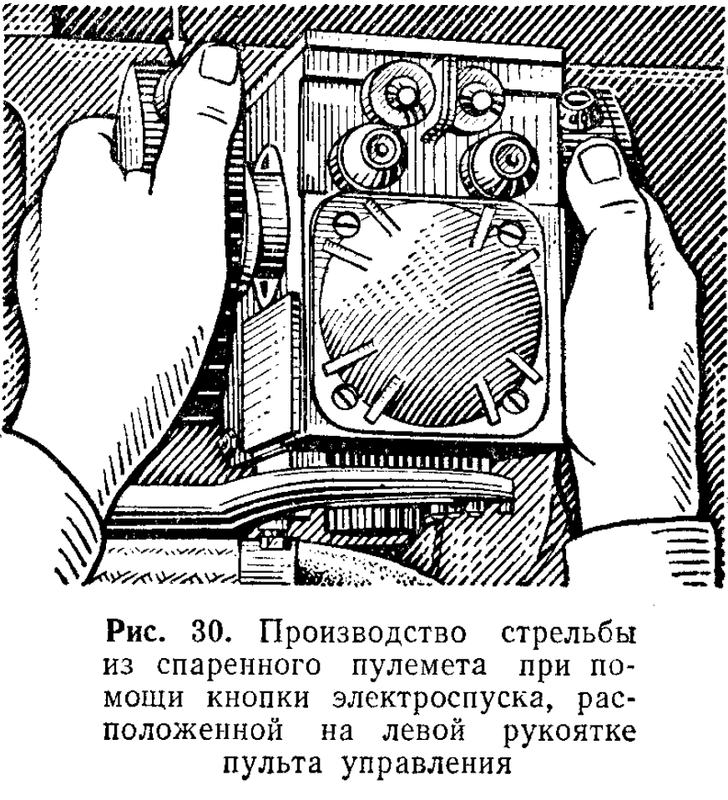 The commander is given a rotating cupola, in which his surveillance equipment is installed. His hatch is of a semicircular shape, and is rather small, making ingressing and egressing a more challenging task than it should be. The hatch features a safety mechanism to prevent the turret from turning once opened. There is a simple solenoid button right next to the locking latch. The button is disengaged when the latch is turned to the locked position, so the turret can turn normally when the hatch is closed. Once the latch is turned to open the hatch, the button is depressed, and this sends an electric signal to the turret traverse system to suspend the traversal of the turret. 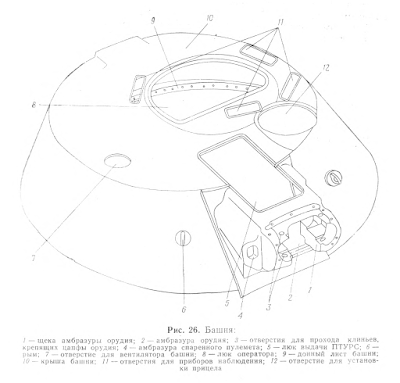 Besides the hatch, the cupola is fitted with a small array of observation devices. The commander does not have much in the way of surveillance equipment. He is provided with a TKN-3 pseudo-binocular periscope and two TNPO-180 general purpose periscopes. This is not many, but this is compensated by the fact that the cupola can be rotated a full 360 degrees. The very light weight of the cupola makes it very easy to spin. It is well known that the OU-3 spotlight creates a deadzone for the turret, but nobody seems to know how this is achieved. It is not possible to program the turret to elevate the cannon when it intersects with the spotlight, as the spotlight changes position when the cupola rotates. There are also accounts of troops in the field removing the spotlight during the daytime to allow the turret to pass over the commander's cupola. It can be deduced that the cannon can avoid crushing the spotlight via a simple feedback sensor in the electromechanical gun laying system; if the turret traverse motor experiences more resistance than usual, it stops to prevent damage to both the spotlight and the turret. The ergonomic qualities of the commander's station are best described as spartan. Being located in the front of the hull next to the engine compartment, the station is longer than it is wide. 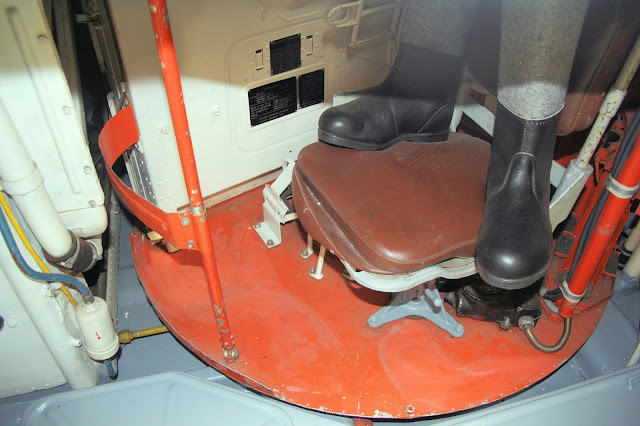 The width of the "corridor" where the driver and commander is seated is only 60 cm, which is quite narrow, but enough for the commander to operate the TKN-3 and swing it around (with elbows tucked in). The gunner's resides in the one-man turret. He is responsible for maintaining the machine gun, cannon, sighting complexes, and autoloader. It is rather cramped in the turret, but this is balanced out to some extent by the lack of a turret basket. This means that the gunner can stretch his legs whenever the turret is not moving, and as he controls the rotation of the turret, he is much more able to ensure the safety of his appendages. The turret floor is a flat sheet of aluminium with level edges except in front of the gunner's seat where the edges are bent upwards to form a shallow ridge. This ridge is there to ensure that the gunner's feet do not slip off the floor. 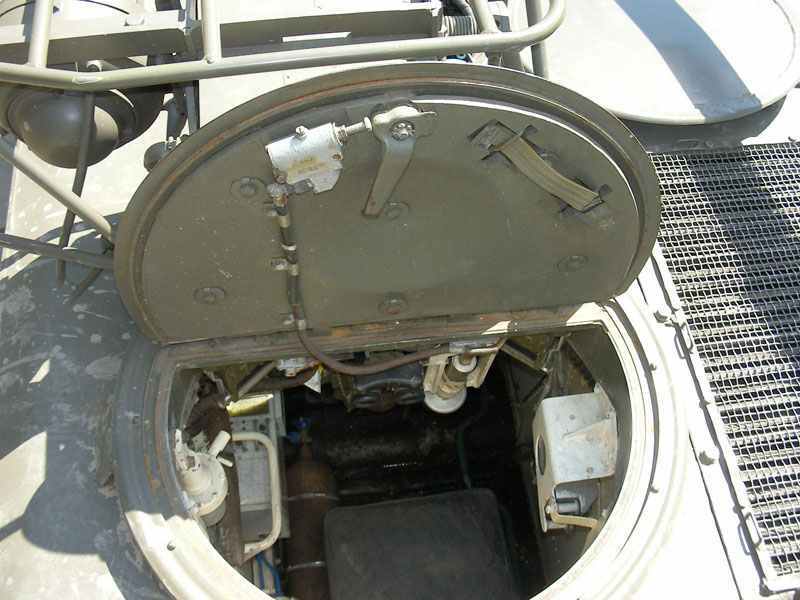 There is also a simple sheet metal shin guard stretching from one of the struts connecting the turret floor to the turret to the ammunition and casing container to the right of the gunner. This shin guard prevents the loader from accidentally putting his knees outside the perimeter of the turret floor. All of this is shown in the photo below, taken by Hans-Hermann Bühling. 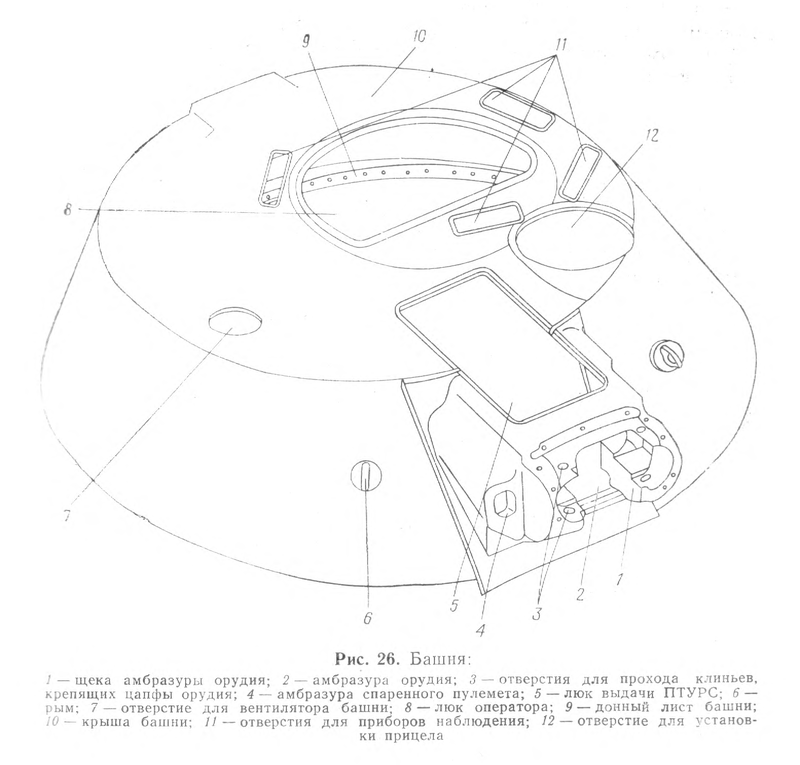 The gunner's hatch opens forward and locks in the upright position, which is a typical Soviet design. If a gunner of average height stands on his seat with the seat in the lowest setting, his head will be just over the edge of the open hatch, so the hatch itself will be able to provide his torso with frontal protection from bullets. Due to the installation of the cannon along the center axis of the turret, the gunner's station is confined to the left half of the turret and the left half of the turret is used for electronic equipment. Components of the 9S428 missile guidance system are installed on the turret wall on the left half of the turret. The gunner is provided with a total of five observation devices in his turret: the 1PN22M1 sight aimed directly forward, and four TNPO-170 periscopes arranged around the perimeter of his hatch. Two of the TNPO-170 periscopes are placed on the flanks of the primary sight to provide forward vision which is helpful for seeing targets and maintaining situational awareness, and the other two are placed on the sides of the hatch to allow the gunner to check his surroundings. There is a dead zone in the 2 o'clock sector as a periscope could not be placed directly behind the breech of the 2A28 "Grom" cannon, as that space was needed for loading the cannon. The photos below shows the layout of the periscopes around the gunner's hatch. Photos by Robert De Craecker. When a mounting post was installed on the right side of the turret roof in the BMP-1P modernization for the 9P135M missile launcher, it partially obstructed the view from the TNPO-170 aimed to the right. The front-right periscope can also be used to aim the weapons in the event that the primary sight fails. Engaging targets with the coaxial machine gun can be done by following the tracers for fire correction, and the "Malyutka" missile can be guided by eye at shorter distances. 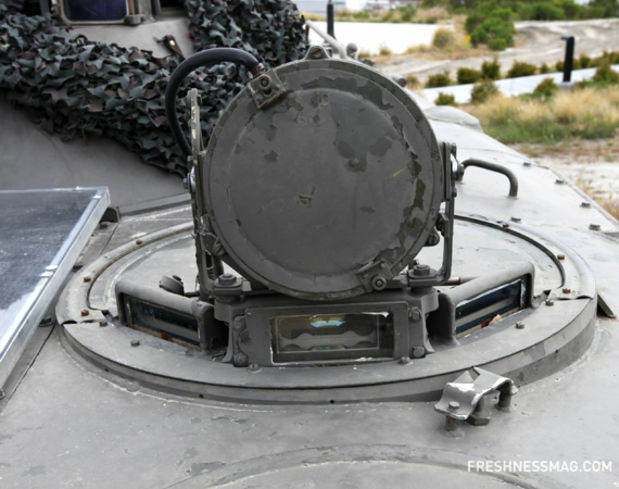 With a total of five observation devices, a BMP-1 gunner has good vision in the forward 180-degree sector of the turret but no rearward visibility whatsoever. To see behind the turret, the gunner can open his hatch or traverse the turret to the left or right by until one of the side-facing TNPO-170 periscopes is aimed to the rear. In an active combat situation or in an NBC-contaminated environment, only the latter option is feasible. 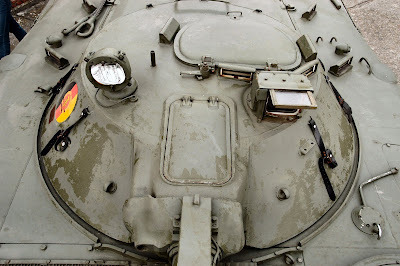 The lack of rearward visibility for the gunner when he is buttoned up was addressed on the BMP-2 when a rear-view prism was added to the gunner's hatch. The good vision from the BMP-1 turret partly compensates for the sub-optimal location of the commander's station and provides the gunner with a high level of independence in target acquisition when the commander dismounts together with the passengers. 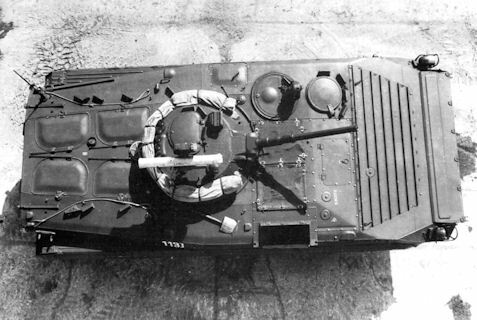 For lighting, there is a PMV-71 dome light located on the turret roof to the left of the gunner's hatch and another one on the turret roof on the opposite side, to the right of the autoloader mechanism. The dome light contains a TN-28-10 incandescent lamp that runs on a voltage of 28 volts and consumes 10 W of power. Each PMV-71 dome light has an output of 10 candelas. For a one-man turret, the amount of illumination is quite good. The gunner has access to a master power relay to control the activation of various electrical systems in the vehicle. 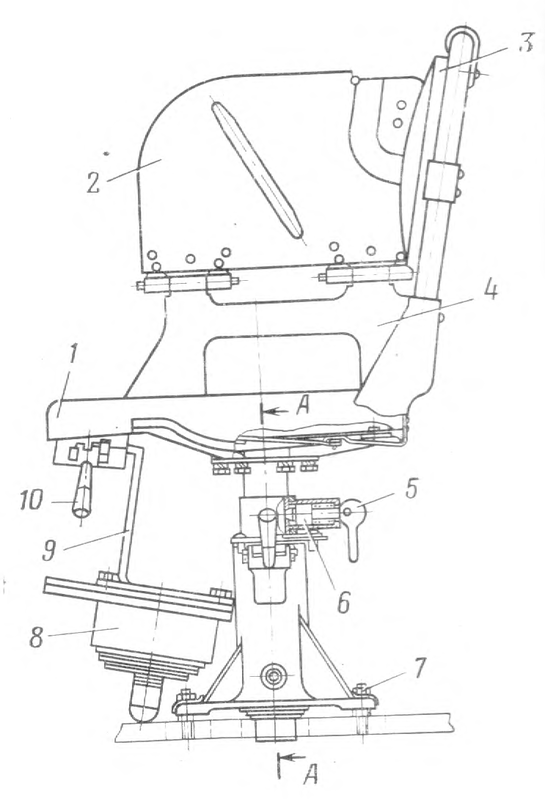 The gunner's seat together with its backrest is adjustable in height. A foldable arm guard is installed on the right side of the seat to isolate the gunner from the autoloader mechanism. 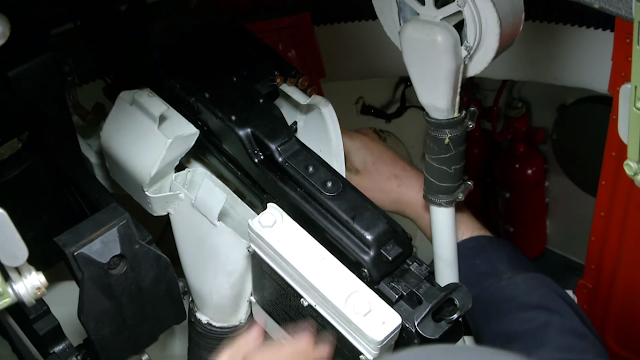 The top half of the arm guard is folded down to allow the gunner to access the two "Malyutka" missiles stowed in the turret when reloading the missile launcher, and the entire arm guard can be detached from the seat for unobstructed access to the turret interior. 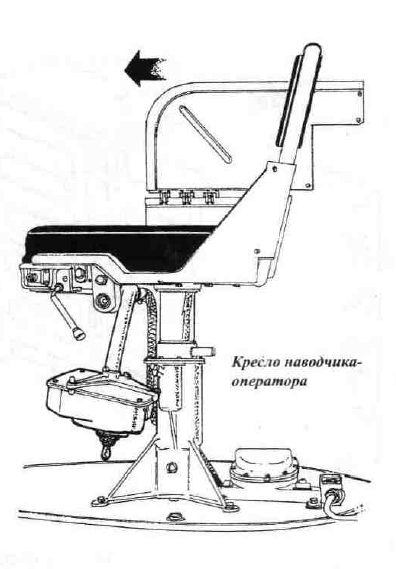 The 9V332 control box with its control joystick for the "Malyutka" missile system is folded under the seat when not in use. With the introduction of the 902V "Tucha" smoke grenade launcher system on the BMP-1P, new control boxes had to be installed. The gunner now has a revised master power relay to turn on the "Tucha" electrical system, and a "Tucha" launch control box to select individual grenades to launch. The 1ETs10M powered gun laying system provides powered turret traverse and gun elevation with satisfactory accuracy using all-electric drives. 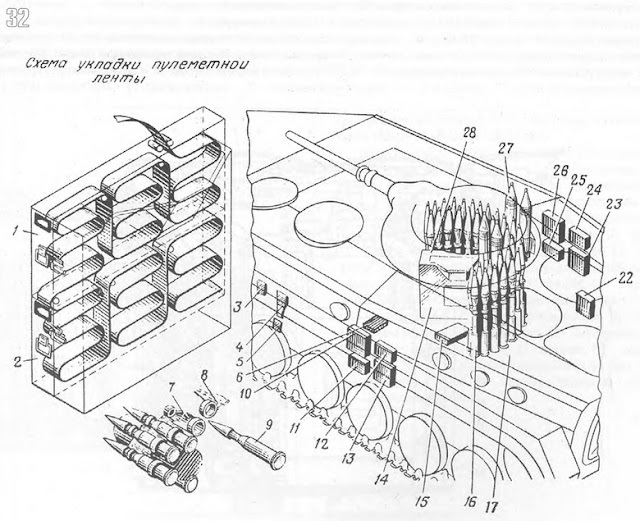 Gun stabilization was not provided and was never provided to any serially produced BMP-1 variant during its career in the Soviet Army, and later, the Russian Army. The gun can be depressed to -4 degrees and elevated to +30 degrees, but direct fire with the 73mm cannon is only possible from -4 degrees to +15 degrees due to the elevation limits of the 1PN22M1 sight. The DGN-3 electric motor is the turret rotation drive. It runs on 24 V and has an output of 300 W. The DVN-1 electric motor is the gun elevation drive. It also runs on 24 V and has an output of 65 W. The maximum speeds of turret rotation and gun elevation are slightly higher than of a T-64 and significantly higher than of a T-62 or T-55, and the precision of fire should be very similar to the older medium tanks. 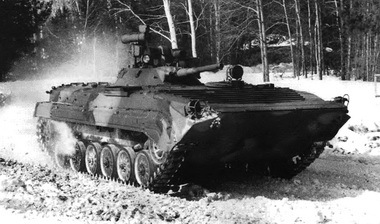 In 1974, the BMP-1 was equipped with the 1ETs10M2 modification of the original powered gun laying system. The new model was adapted to the removal of the autoloader system in accordance with the introduction of HE ammunition for the main gun. As such, the control handles no longer feature switches for controlling the operation of the autoloader and the gun elevation system no longer locks the gun to line it up with the autoloader ramming mechanism. The BMP-1 cannot fire on the move with any guarantee of accuracy unless the vehicle is travelling over a well paved road at low speed. Nevertheless, BMP gunners are trained to fire on the move. To maximize training time without needing to cover the costs of maintenance and fuel, the training was often done on simulators. These simulators were platforms built into the ground which the BMP would park on. To simulate the experience of driving over uneven terrain, the platform oscillates at various intensities while the gunner uses the coaxial PKT machine gun to engage pop up targets representing infantry. Video footage of a firing exercise taking place can be found on YouTube on yolkhere's channel, here (link). The short video and the limited amount of information I have gathered doesn't say if gunners were trained to fire the 73mm cannon from the platform, but as far as I know, it was not part of the curriculum. Live fire training at the firing range was more extensive as it involved both tank and infantry-type targets and tested the coordination of the entire crew, not just the skills of the gunner. This made time on the range irreplaceable, not that further evidence was needed. Due to the presence of the OU-3GA infrared spotlight on the commander's cupola, a deadzone with an arc of 50 degrees was created. 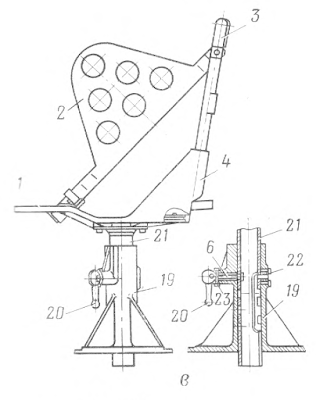 The turret cannot be aimed at the normal angles of gun elevation over this arc, and instead, the gun must be elevated over the spotlight. Another deadzone exists over the rear arc where the gun depression angle over the troop compartment roof is reduced to a maximum of -2 degrees instead of the normal -4 degrees, but this is completely normal for practically all turreted tanks and should not have a significant effect during combat. The PU-6 control hand grips are used are used with this system. The right hand grip has a thumb button for firing the "Grom" cannon and the left hand grip has a thumb button for firing the coaxial machine gun. One of the design requirements stipulated for the BMP was that it had to have a sighting system equal in capabilities to the tanks it was to complement. This included a night fighting capability. 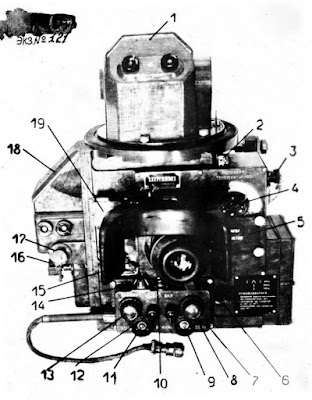 As a result, the 1PN22M1 combined day-night sight was developed. 1PN22M1 is a relatively advanced sight that is functionally similar to the TPN-1-22-11 auxiliary sight used in the T-54B. As the "N" in its name suggests, it features night vision capabilities together with the typical daytime functionality. 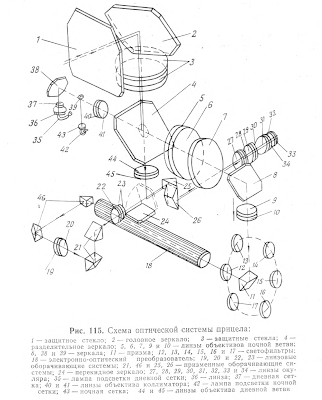 By rolling two features into one sighting system, Soviet engineers were able to save space inside the small turret and simplify the sighting system without compromising overall effectiveness. The night vision system is housed in the left side and bottom of the sight housing. 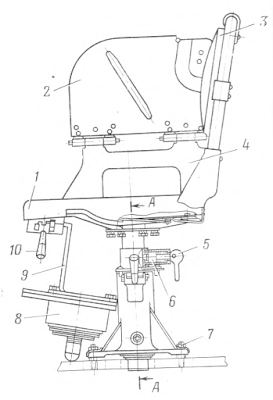 The left "shoulder" of the sight contains a reflector assembly with one mirror and a prism that projects light collected from the objective lens of the sight into the U-42-M light intensifier tube at the bottom of the sight. The amplified image is then reflected to the eyepiece of the sight through four prisms. The gunner looks through the same eyepiece for both the day and night channels. The sight has fixed magnification of 6x and a field of view of 15° in the day channel. This was adequate given the effective range of the main gun and the coaxial machine gun. The magnification power of the 1PN22M1 is directly comparable to that of tanks with larger, high power cannons like the M48, which used the M20 sight with 6x maximum magnification, but it lacked the variable magnification of the TSh2-17 sight of the T-54. The 1PN22M1 offers a notably higher magnification than the PGO-9 periscopic sight used on the SPG-9, which only had a 4.2x magnification with a field of view of 10.5°. This means that a BMP-1 gunner should be able to lay his sights on target more precisely than an SPG-9 gunner under any given circumstance, but needless to say, both the commander and gunner of a BMP-1 have much less visibility when they are buttoned up compared to an SPG-9 crew. The viewfinder of the sight is abundantly marked for ballistic drop and lead. Windage was adjusted using the lead scales. The small crosshair at the top of the viewfinder is zeroed for 50 meters, so it won't really be used in combat. The sight is complete with a stadiametric rangefinder. The rangefinder scale is intended for a target 2.7 meters in height, starting from 400 meters and ending at 1,300 meters. Below 400 meters, the trajectory of PG-15V rounds is flat enough that the battlesight gunnery technique is sufficiently accurate for achieving a probability of hit exceeding 90%, and fire correction can be accomplished with the burst-on-target gunnery technique if it is truly necessary. There are no range scales between the 50-meter crosshair and the 400-meter range scale. The target height of 2.7 meters is representative of the height of the average Western tank, including the Chieftain, M48, M60A1, Leopard 1, and even some non-tank vehicless like the Marder 1, although the Marder did not exist prior to the BMP-1. The sight is switched to the night vision channel redirecting the light collected from the objective lens away from the day channel optics to the reflector assembly located in the left side of the sight. The light then passes through one of six light filters on a revolving disc before entering the light intensifier tube at the bottom of the sight. 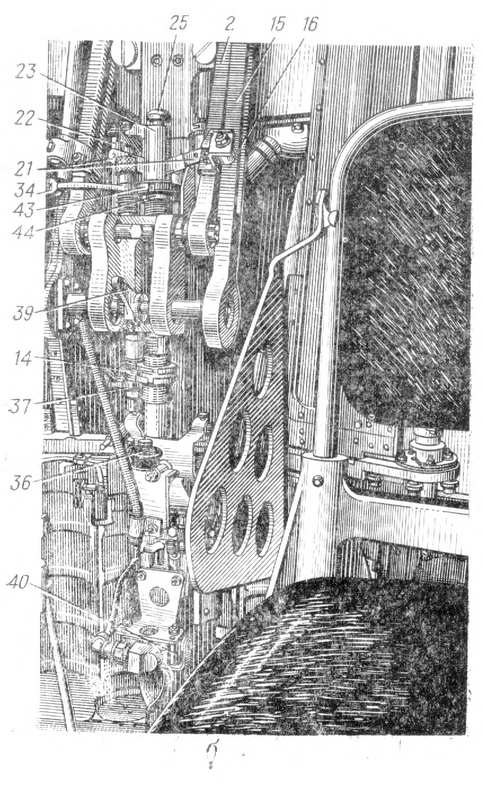 The gunner chooses the filter by rotating the knob at the bottom left of the sight, shown in the drawing on the left below. The light filters are designed to provide the optimal level of contrast in various lighting conditions, including daylight. The designations of the various filters and their purposes are listed in the table below. Filters 'O' and 'KS-17' are intended for use at night under natural illumination from starlight and moonlight. Filter 'NS-10' is intended for use at twilight. Filter 'NS-11' is intended for use in overcast daylight conditions. Filters 'NS-12-1' and 'NS-12' are intended for use during sunny weather. The night vision channel has a separate viewfinder reticle design from the daytime channel. It has greatly simplified lead scales, and it lacks a stadia rangefinder. The reticle is illuminated by a green bulb to facilitate aiming at night. The sight has fixed magnification of 6.7x and a field of view of 6° in the night channel. Night vision was provided by a passive image intensifier system running on a 40 kV power supply, enabling the gunner to identify and fire upon a tank-type target at a distance of 400 meters. Due to the extremely short range of vision, range estimation was not necessary. The gunner could simply lay the center chevron in the viewfinder on a target and open fire immediately once it is identified and expect a high probability of scoring a first-round hit. 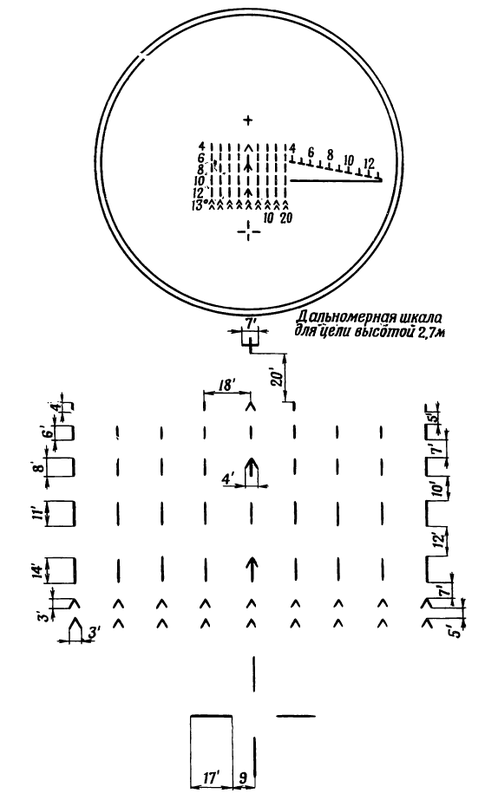 As the markings show, the BMP-1 is theoretically capable of engaging targets up to a distance of 800 meters at night using the 1PN22M, but the center chevron is calibrated for 400 meters, as that is the distance limit for the night vision system. 1PN22M2 was introduced in 1974. From a technical viewpoint, it is identical to the 1PN22M1 in almost every way. The only functional difference is the addition of a scale for HE-Frag rounds which extends far below the original scale for HEAT rounds due to the low velocity of OG-15V HE-Frag rounds. Around the same time, the PGOK-9 sight with compatibility with HE-Frag rounds for the SPG-9 was introduced. As you can see in the diagram above, the sight is marked for a maximum direct fire range of only 1,600 meters for HE-Frag. This is the hard limit of the direct fire capabilities of the BMP-1 using OG-15V HE-Frag rounds, and also the maximum range of the rounds. The BMP mounts the 73mm 2A28 "Grom" low-pressure smoothbore cannnon. 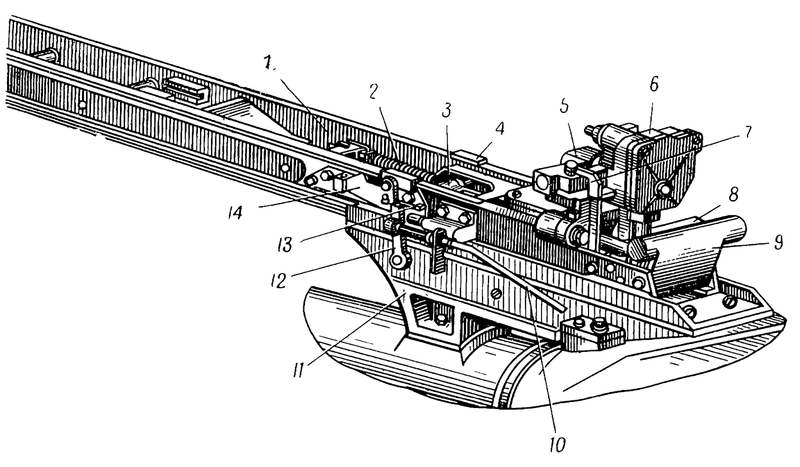 The cannon has a vertically sliding breech block with a spring-loaded folding shell casing deflector at the end of the breech assembly. 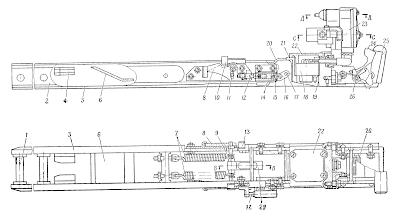 The cannon has a total length of 2,180mm and a gun tube length of 2,117mm, which is longer than the gun tube of the SPG-9 despite its longer chamber for the larger propellant charge. The barrel life of "Grom" is 1,250 shots. The cannon can elevate between -4 degrees to +30 degress, but direct fire is only possible from -4 degrees to +15 degrees due to the elevation limits of the 1PN22M1 sight. The cannon does not have a fume extractor, so it would tend to be quite unpleasant to remain confined inside the small turret of the BMP after a sustained burst. 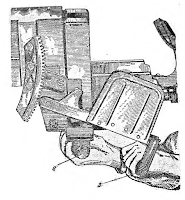 The breech block can be manually opened with a cam operated by a lever handle located underneath the casing deflector, as shown in the photo below. 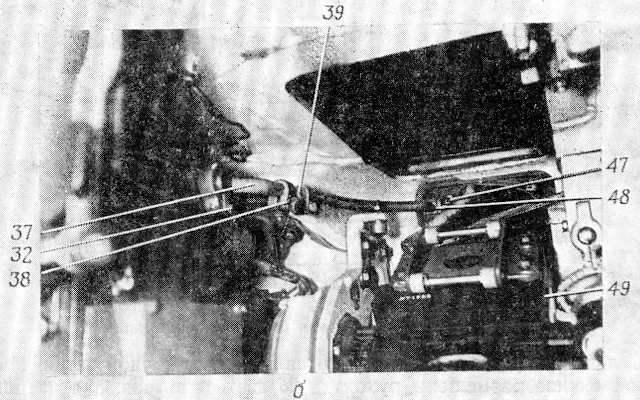 A recoil guard is attached to the lever. A hydraulic recoil buffer and recuperator mechanism is wrapped around the base of the barrel in an armoured sleeve. The chamber of the gun tube is inside the cast steel mantlet, and only the breech can be seen from inside the turret. The recoil buffer sleeve also has built-in provisions for mounting the "Malyutka" launching rail. When a missile is mounted on the launcher, the cannon becomes somewhat unbalanced by the weight. The missile itself weighs 10.9 kg and it is located forward of the gun trunnion, making the gun rather front-heavy. "Grom" is incredibly lightweight, weighing only 115 kg on its own. 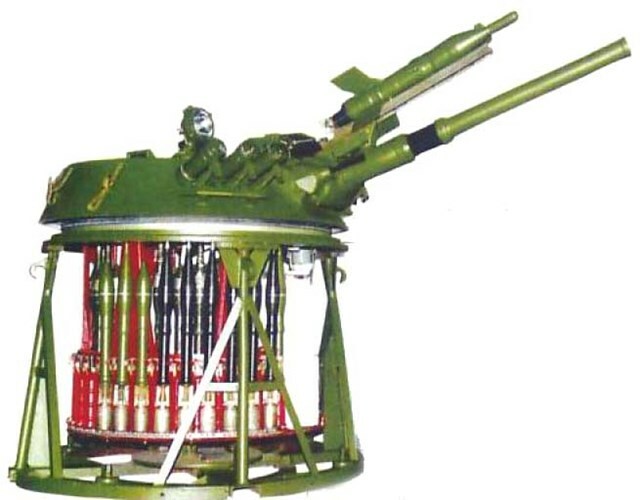 Of course, its weight is not so impressive when compared to the SPG-9, which weighs 49.5 kg with its direct fire sight and without its tripod and aiming mechanism. This is mainly due to the need for a recoil mechanism and a breech to withstand the chamber pressure. 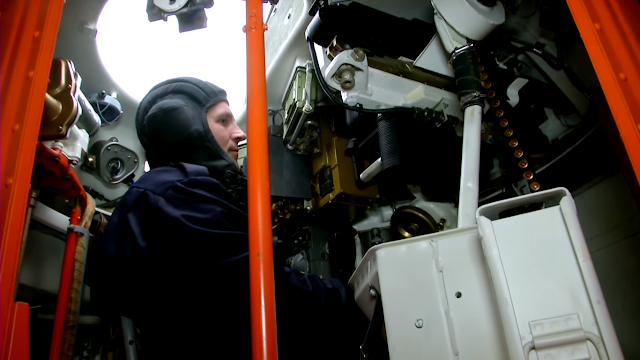 When installed inside the BMP-1 turret, the full gun assembly includes the cast steel gun mantlet, the "Malyutka" missile launch platform on top of the recoil buffer sleeve, and a set of rollers for aligning the top of the gun breech with the missile launch platform. Even back in 1966, it was a somewhat unusual decision to use a low-velocity cannon in lieu of the typical heavy machine gun or autocannon as was normal for both purpose-built IFVs as well as APCs pressed into service in the IFV role. The convention that was followed by foreign militaries at the time was based on relatively sound reasoning: in a typical skirmish where tanks do not need to be involved, an armoured troop carrier should only face light resistance, and indeed, the ACAV modification of the M113 that was used by U.S forces and the ARVN during the war in Vietnam was only armed with externally-mounted M2 and M60 machine guns with gun shields for protection, and this was deemed to be enough for shock action against light infantry. In most cases, even a basic M113 was effective when the opposition was armed only with small arms and small numbers of anti-tank weapons. If additional firepower is desired for a vehicle intended for the same role, a rapid-fire autocannon would be far more efficient at dispatching infantry, soft-skinned targets and lightly armoured vehicles compared to a large caliber semi-automatic cannon. A low-pressure cannon is also ineffective against low-flying aircraft, including helicopters. The main downside is that the 73mm HEAT rounds fired from the "Grom" have an extremely limited fragmentation effect and the explosive charge is not powerful enough to eliminate soft-skinned targets in the open. According to comparative data presented to promote the "Kliver" combat module, a basic BMP-1 only has a 35% chance of eliminating an ATGM team with two shots from its cannon at a range of 500 meters. This drops to a measly 10% at a range of 1,000 meters. For comparison, a 30mm autocannon (the 2A72 in this case) has a 100% chance of eliminating an ATGM team with sixteen shots at 500 meters, 50% chance at 2,500 meters, and 40% chance at a range of 4,000 meters. In this comparison, both vehicles are stationary. From this, it is evident that the BMP-1 was largely incapable of countering man-portable ATGMs which is a noteworthy drawback as the BMP-1 entered service during an era when such weapons were prolific. The effectiveness of the "Grom" in this role was improved when OG-15V HE rounds were introduced in 1974, but even so, the range is still limited due to the very low velocity of the OG-9 grenade. If the BMP is being used to supplement a breakthrough attempt, it will not be the centerpiece of the attack. One of the tactics detailed in field manuals is: when tanks are available to support the advance, one tank can be attached to each mechanized platoon. The three BMPs follow the tank at a distance of 100 to 200 meters, with either dismounted or mounted infantry. The tank will take care of the toughest targets with its cannon, and the BMPs will knock out anti-tank weapons and lightly armoured vehicles in support of the tank. When a motorized infantry platoon with BMPs is operating without tank support, the modest capabilities of "Grom" would be the most potent anti-armour weapon available to the platoon besides the integrated "Malyutka" missile, so avoiding contact with enemy tanks is a priority. If enemy tanks are not encountered, the 73mm cannon will prove most useful against hardened field fortifications, buildings, and fixed weapon emplacements like machine gun and recoilless rifle nests, and so on. The penetration and blast effect of its HEAT grenades would be particularly useful on fortifications that are otherwise completely immune to machine gun fire, like a triple layer of sandbags (a common standard during the Vietnam war) or a double layer of sandbags reinforced with timber. Given that the light weight of the BMP-1 allows it to be deployed where tanks cannot go, the firepower of a 73mm cannon becomes particularly meaningful for the troops that are deployed together with the vehicle. From this perspective, there were clear merits to the use of the 73mm "Grom" in the BMP-1. Indeed, there are are a multitude of valid reasons why a weapon like "Grom" is preferable for the BMP rather than a heavy machine gun or a rapid fire autocannon. For one, the firepower of a large caliber cannon is indispensable in many situations. The need for such weapons was met in Vietnam by configuring the M113A1 ACAV with a pintle-mounted 106mm M40A1 recoilless rifle to be operated from the passenger compartment roof hatch. The M113 ACAV with the M40A1 had tremendous firepower but the vehicle provided no protection whatsoever for the gunner and had a severely constrained rate of fire due to the small roof hatch of the passenger compartment and inconvenient location of the weapon itself; the rear of the gun tube extended behind the roof hatch, so the loader has to contort himself to fit each cartridge - almost a meter long and weighing 16.4 kg - through the breech. It was also unsafe for personnel to stand behind or even near the vehicle when the M40A1 is in use due to the colossal back blast and firing signature. The British FV432 "WOMBAT" had an even more powerful 120mm L6 "WOMBAT" recoilless rifle mounted in a layout similar to the M113 and thus shared the same fundamental shortfalls, exacerbated by the more massive size (more than 1.1 meters) and weight (27.2 kg) of the cartridges. As such, these vehicles were tactically distinct from the BMP-1 and neither of the two were proper analogues. The British Alvis Saladin armoured car and FV101 Scorpion reconnaissance vehicle were both armed with 76mm low pressure guns in fully enclosed turrets, and the Australian Army developed a closer analogue of the BMP-1 in 1967 by mating the fully enclosed turret of the Saladin armoured car with a 76mm L5A1 low pressure gun to the hull of the M113A1, thus creating the Saladin FSV (Fire Support Vehicle). In continuation of this concept, the MSV was created in 1976 by mating the turret of a Scorpion with its 76mm L23 low pressure gun to the M113A1. But even so, these were still fire support vehicles and not IFVs. The BMP-1 was completely unique in its combination of traits in 1966 and for better or worse, remained unique throughout the remainder of the Cold War. From the perspective of the Bundeswehr, the decision to mount the 20mm HS.820 on the SPz 12-3 and the 20mm Rh202 on the Marder was motivated by the need for sufficient firepower to deal with dismounted infantry and lightly armoured troop carriers. In the Soviet Army, this need was met by using a combination of a 14.5mm KPVT heavy machine gun and a 7.62mm SGMT or PKT general purpose machine gun. This armament scheme was established as the standard armament of Soviet armoured personnel carriers and armoured cars beginning with the BRDM-2 (1962) and the BTR-60PB (1966) which both used the same BPU-1 turret. The KPVT would be used against armoured personnel carriers - such vehicles would typically only have limited protection from 12.7mm machine guns - and infantry behind solid obstacles, and the SGMT or PKT would be used against infantry in the open. Although the KPVT is not as useful in the anti-personnel role as a 20mm or 23mm rapid-fire autocannon as its caliber is too small to deliver an effective explosive payload, it fulfilled the same niche in every other respect and was more than adequate for armoured personnel carriers. With this in mind, an escalation in firepower to encompass tanks as the primary target for an IFV like the BMP-1 is not unusual. The point blank range of the cannon with PG-9 HEAT grenades against a medium tank target with a height of 2.7 meters is 800 meters. 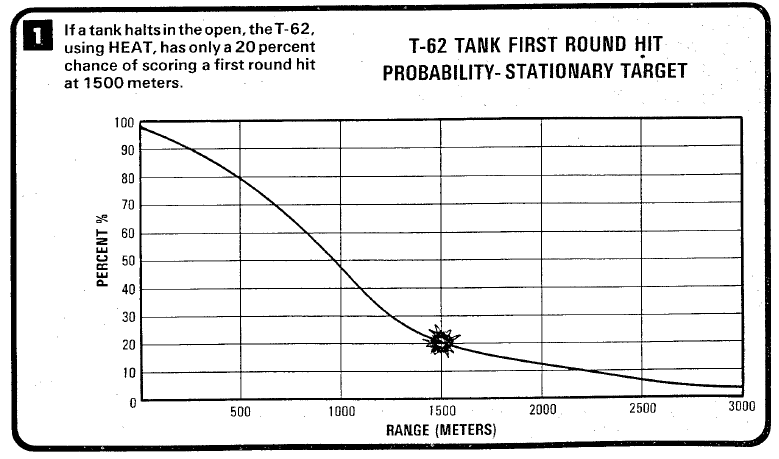 Theoretically, this allows the gunner to neglect the range estimation process and open fire immediately at a tank within 800 meters with a reasonable expectation of scoring a first-round hit, but in reality, the probability of achieving a hit on a tank-sized target rapidly drops past 500 m, so the effective range is generally considered to be 500 meters and 700 meters is considered the maximum effective range. For comparison, the 106mm M40A1 recoilless rifle firing the M344A1 HEAT round is stated to have a maximum effective range of 1,000 yards, or around 914 meters. The accuracy of the "Grom" cannon is functionally equal to that of the SPG-9, which can hit tank-sized targets at the same success rate at the same distances. Indeed, the PG-9 rocket fired from the 2A28 has a muzzle velocity of 400 m/s - already supersonic - and rapidly accelerates to 665 m/s using its rocket engine after travelling approximately 20 meters from the muzzle. This gives the grenade a very flat trajectory that facilitates easier fire correction at short ranges. In this video (link), you can see the SPG-9 being used on a stationary BMP. Both shots connected, and struck the hull at approximately the same area. Judging by the time taken between the shot and the impact, the distance was around 400 meters. As the firing characteristics of the "Grom" cannon are essentially identical to the SPG-9, the plethora of SPG-9 videos on YouTube and Yandex Videos can be taken as surrogates for the "Grom". This video (link) of American soldiers demonstrating the SPG-9 on static targets at distances of 500 m, 400 m, 300 m and 200 m is a good display of the accuracy of PG-9 type rockets at such ranges. Zaloga claims that the "Grom" can achieve a 70% hit rate on a stationary tank-type target at 500 meters in still air, degrading to 50% at 800 meters. 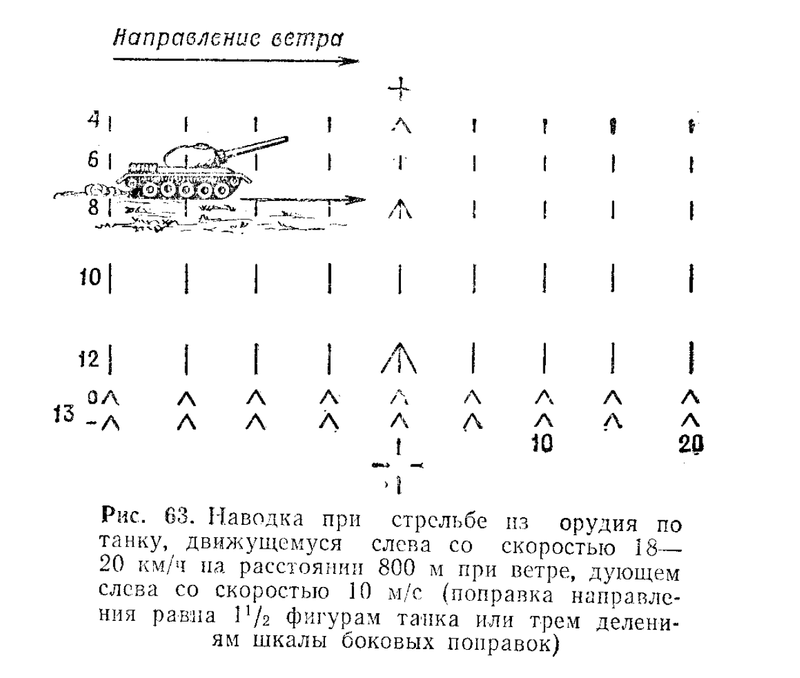 This is not high compared to a high velocity tank cannon, but still quite respectable, as this is already somewhat close to the performance level of the T-62 firing 3UBK-3 115mm HEAT shells, as you can see in the TRADOC bulletin diagram below. An M60A1 could achieve an 80% hit rate with its own 105mm HEAT shells at the same range thanks to its optical coincidence rangefinder. Without knowing what sort of target the used to determine the probability of hit data supplied by Zaloga, we cannot make any firm conclusions. Nevertheless, the ineffectiveness of the "Grom" cannon at long range is hardly a secret. During one of its trials, a BMP was made to open fire against a stationary T-55 tank at 800 meters. 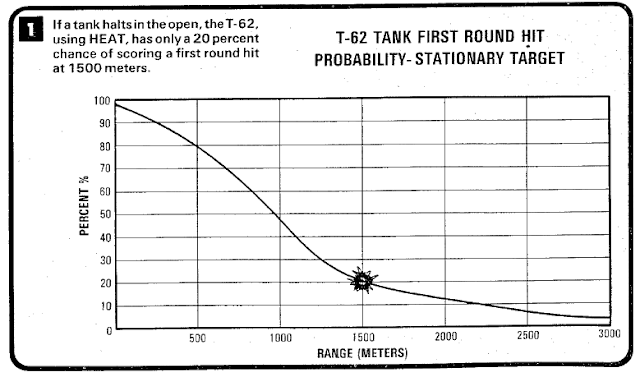 Out of 50 shots, only 17 hit the tank - others were carried off their trajectory by the wind. This is a 34% hit rate. However, the key word is "T-55". Against NATO tanks, the "Grom" may prove slightly more dangerous. It is common knowledge that the silhouette size of NATO tanks is noticeably bigger than the T-55 and all contemporary Soviet tanks in general. The British Chieftain tank, for example, is 2.9 m tall and 3.66 m wide. The American M60A1 is similar at 2.9 m tall (not counting the very large commander's cupola) and 3.63 m wide. The German Leopard 1 was 2.6 m tall and 3.25 m wide while the French AMX-30 was by far the smallest at 2.52 m in height and only 3.1 m in width. The T-54 is only 2.4 m tall and 3.37 m wide. Therefore, it can be inferred that the "Grom" has a slightly more than 50% chance of hitting a stationary M60 or Chieftain at a distance of 800 meters under favourable weather conditions when using the standard PG-15V HEAT round. The gunner will have to rely more on the ATGM when engaging tanks at distances exceeding 800 meters, and will become totally dependent on the ATGM when fighting at distances of more than 1,300 meters. According to comparative data presented to promote the "Kliver" combat module, a basic BMP-1 has an 80% chance of destroying an armoured personnel carrier with two shots from its cannon at a range of 500 meters. This drops to only 25% at a range of 1,000 meters. As a fighting system, the "Grom" cannon was the most potent direct fire weapon organic to a motorized infantry squad equipped with a BMP-1. An RPG-7 with five grenades would be carried by the grenadier in the squad and it would be operated together with the assistant grenadier. The RPG-7 was a powerful weapon in its own right, but it belonged to a different class than the "Grom". The penetration power of the original 85mm PG-7V grenade from 1961 was also less compared to the 73mm PG-9 fired by the "Grom" - 260mm RHA compared to 300mm RHA. In 1969, the improved 70mm PG-7VM grenade entered service with a warhead derived from the PG-9 and a new propulsion system. The deflection of the projectile from crosswinds was decreased by 1.5 times and the accuracy of fire was increased by around 20-25%. But even with these improvements, the probability of hitting targets beyond 300 meters was still a challenge. 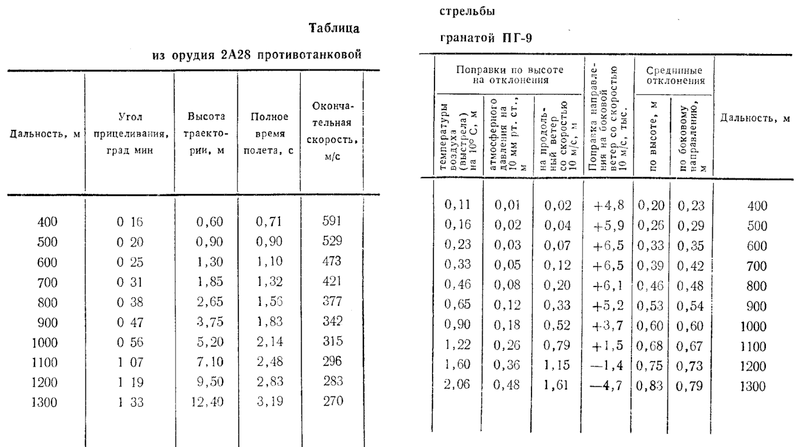 The number of shots needed to "defeat" an armoured target in various situations is detailed in page 58 the manual "Наставление по стрелковому делу Ручной противотанковый гранатомет РПГ-7, РПГ-7Д " (Manual on the Matters of Firing Hand-held Anti-tank Grenade Launcher RPG-7, RPG-7D) from 1972. The manual does not specify the type of armoured target or the definition of "defeat", but it can be reasonably assumed that the figures refer to the number of shots needed to hit a tank rather than the number of shots needed to kill a tank, as multiple direct hits are usually needed to destroy a postwar tank. At 100 meters, both the original PG-7V round and the improved PG-7VM round needed only one shot on the frontal aspect of a target moving at 20 km/h, one shot is needed on the profile of a target moving at 20 km/h, and one shot is needed for a tank in a prepared hull-down position. When the distance increases to 200 meters, the number of PG-7V rounds needed increases to two for the frontal target and four for the hull-down target, and the higher precision of the PG-7VM round begins to show itself as only three shots are needed for the hull-down target. The gap between the PG-7V and the PG-7VM widens as the distance increases, but the limits of the RPG-7 are quite evident as the PG-7VM round achieves a 50% hit probability for the front silhouette and side silhouette of moving tanks at just 200 meters and 300 meters respectively. At such ranges, "Grom" has a 90% chance of hitting a tank-type target. 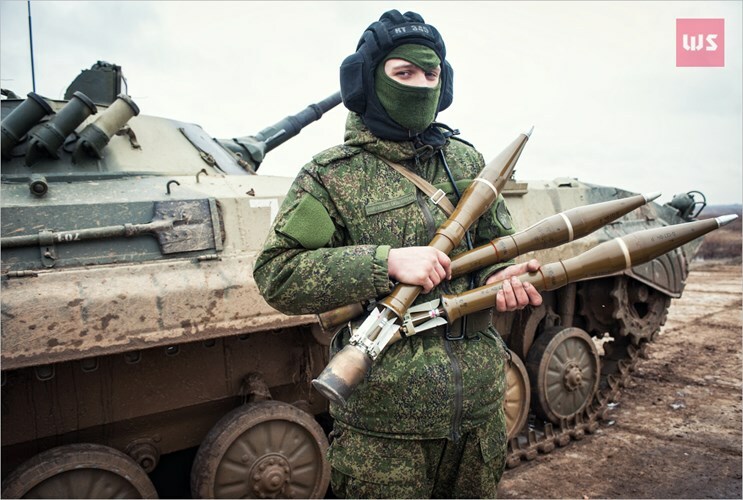 Compared to the RPG-7 carried and operated by the anti-tank grenadier in the squad transported in a BMP-1, the maximum effective range of the "Grom" against a tank-sized target is up to four times higher. Most of the difference can be attributed to the much higher velocity of the PG-9 round: the muzzle velocity of the PG-9 is 400 m/s m/s and the maximum velocity is 665 m/s. In comparison, the PG-7VM round has a muzzle velocity of 140 m/s and a maximum velocity of 300 m/s, so it remains subsonic throughout its entire flight. The probability of hit with an RPG-7 was therefore much more sensitive to errors in range estimates and it was additionally affected by operator stance, which is a factor that is not relevant for a tripod-mounted weapon like the SPG-9 or the vehicle-mounted "Grom". However, the PG-9 grenade had much higher drag than a typical spin-stabilized round fired from a tank gun and was intrinsically limited in its range. Needless to say, "Grom" was far from a match for postwar tank guns and as such, the BMP-1 would be consistently outgunned in any duel with a tank if it relied on its cannon alone. However, the advantage of the BMP-1 against contemporary tanks is that the gunner can fire an ATGM from under armour protection in a turret-down position at ranges where the enemy tank has practically no chance of scoring a direct hit. This is thanks to the combination of a periscopic sight on the turret roof and the mounting of the "Malyutka" launch rail on the gun barrel above the level of the turret roof. Even if the BMP is in a hull-down position rather than a turret-down position, the extremely small silhouette of the turret makes it very easy to conceal and very difficult to hit with direct fire. In other words, the short effective range of the "Grom" was not a problem when considering the full suite of weapons on the BMP-1 in its totality. 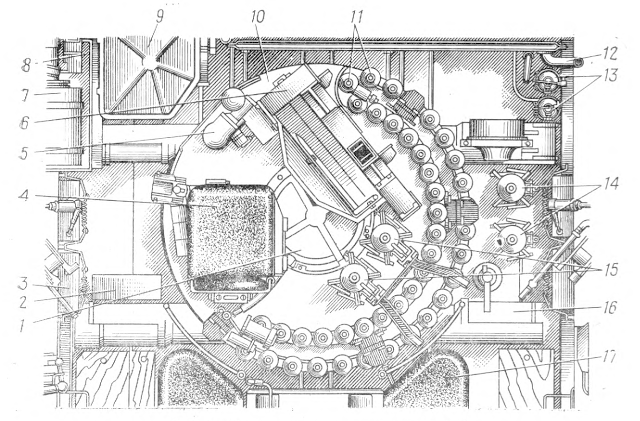 The cannon is fed with 40 rounds of ammunition, stored in a crescent-shaped conveyor. As far as conveyors go, the BMP's conveyor is as simple as they get. It's basically a bicycle chain with a rocket grenade clipped between two of each extended link. Grenades are attached to this chain with a very simple spring-loaded tab, which is nudged by the autoloader arm to release the grenade. The average speed of a loading cycle is 6 seconds, plus one second for the gun to elevate or depress to the proper angle before and after loading. This means that the BMP can achieve a theoretical rate of fire of 8 rounds per minute, but "theoretical" is highly emphasized. In reality, the gunner should spare a second or two to observe the point of impact of his shot, in order to make corrections for his second. The aimed rate of fire, therefore, should be no greater than 6 rounds per minute. So how exactly does the autoloader work? 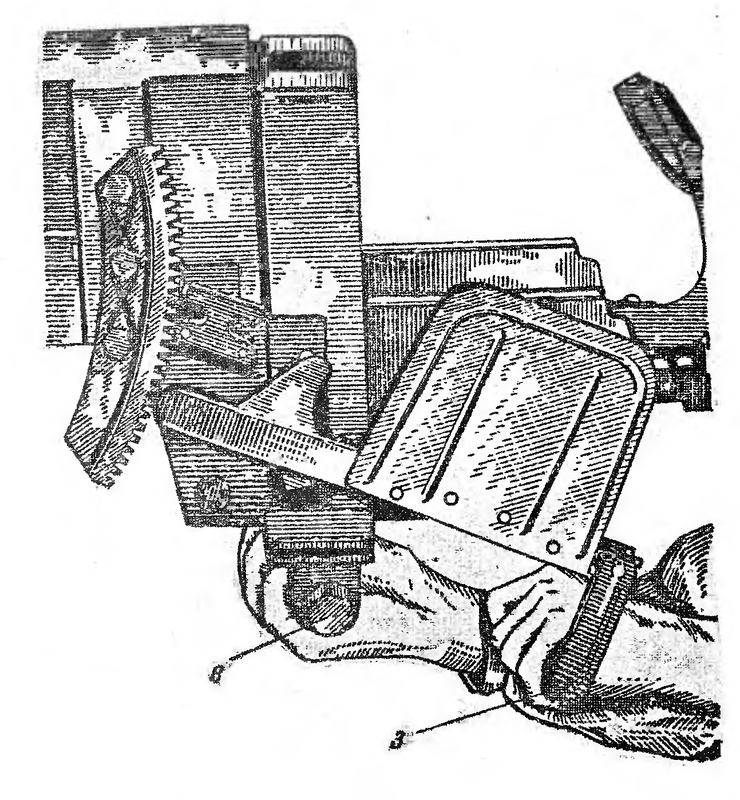 The autoloader arm hinges upwards, and the grenade is pitched forward over the gunner's right shoulder and into the breech. To load, the cannon must be elevated by +3 degrees. The ammunition conveyor occupies the 1 o'clock to 7 o'clock sector of the perimeter of the turret floor. The autoloader elevator arm is shown in the two pictures below. The photo on the left by Robert De Craecker shows a BMP-1 formerly belonging to the NVA. To initiate the loading cycle, the gunner presses a switch on his powered gun control handles. 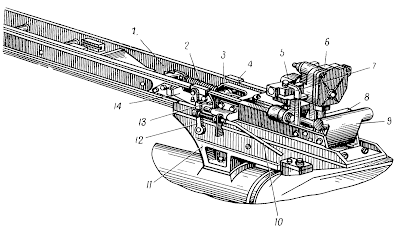 The manual states that the gunner should not hold his arm close to or in front of the autoloader as this could cause the autoloader to malfunction, presumably due to his jacket getting pinched by the swinging arm, but it is unlikely for the gunner's arm to be "eaten" for the simple fact that the autoloader arm just isn't powerful enough to tear an arm off. 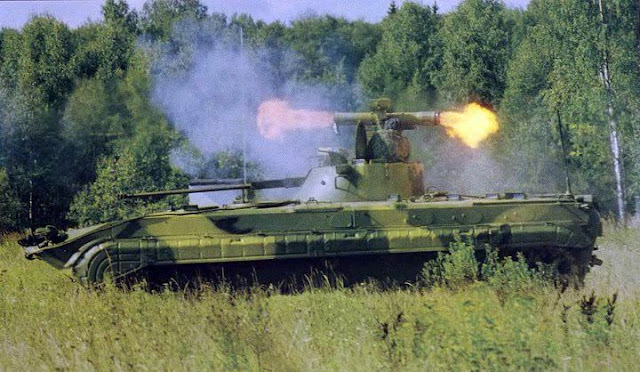 However, if there is any truth to the oft-repeated "fact" that Soviet tank autoloaders created an entire generation of armless tank gunners, it should have spawned from the BMP-1. For some reason, the BMP-1 has never been associated with gunners missing arms, even though it is the only Soviet armoured vehicle with an autoloader where this could technically be possible. Besides the arm guard installed on the gunner's seat, there is an additional perforated metal shield fixed to the turret to separate the gunner's seat from the autoloader mechanism. It is shown in the drawing below. Like the autoloader, the ammunition storage scheme in the BMP-1 is perhaps far less dangerous than the layman is led to believe. The idea that simply hitting a piece of ammunition with shrapnel will excite a detonation is simply untrue. 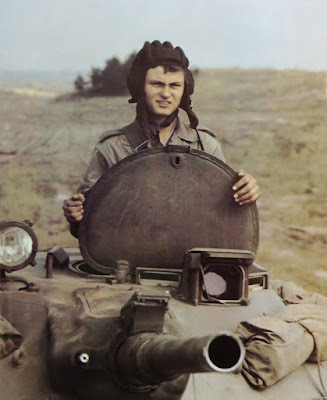 One interesting anecdote on the safety of the ammunition stowed inside a BMP-1 comes from a gunner who served in the first Chechen war whose account has been reproduced here (link). The relevant passages are shown below. "Finally, on comms we got info that an RPG had taken up position on the 7th (or 5th) floor of the 12 story building - so then I tried to, like in training, fill the whole floor, one HE round into each window. Now, for at least a few minutes, all of us gunners had a job to do: Someone called in a target, and we laid down fire in that direction. Everything was OK, but suddenly, shaking the armor and blowing open my hatch, "lightning" hit. The compression blast compressed my rib cage for an instant, and my heart dropped into my heels, I just barely had time to cover my face with my gloves. When everything calmed down, I looked around - "What WAS that? An RPG hit? But then the vehicle would be a 'rose' [blown open], or everything inside would be on fire, and I wouldn't be here thinking about it!". I see Yurik is also completely fine, he rolled up his coat collar. Checked the optics, turned the turret left, right - don't see any fighters, but just in case I loaded a round into the breech and started firing the cannon and the machine gun at previous targets. Not five minutes passed, and the "lighting and thunder" hit again. Again, covered my face and braced. Yurik was swearing on internal comms. When the ringing stopped, I looked around - on the right side, level with the track there was a big hole. The thought "I could get my hand through there!" flitted through my mind. It's like the thick armor had been opened up with a giant scalpel. "The grenade must have exploded next to the vehicle!" - I figured - "Well of course! Otherwise the ammo would have already popped! The ammo..." I checked the ammo conveyor and spotted one with a hole in the warhead, and then another. Whether or not they were dangerous or not, I had no idea. I radioed the company commander and asked him. His answer was a simple and effective "Toss 'em", and I did just that. Figuring that our vehicle had been shot at from the right, I opened fire on the construction site." From the journal "Tea with a Hint of Diesel", by S. Bochkarev. Ironically, the ammunition saved the gunner by absorbing shrapnel that would have otherwise hit him. The explanation for this unexpected outcome is rather simple: the explosive charge in a HEAT warhead is an insensitive plastic explosive compound - an extremely energetic projectile is required to detonate it. A shaped charge jet is more than enough, but spall and other fragmentation would usually not suffice. The propellant charge of any cartridge tends to be far more volatile, and is the main culprit of catastrophic vehicle losses. 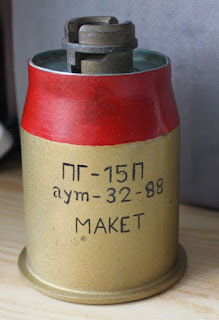 However, the propellant for the rocket engines of the PG-15V rounds are below the warhead and the steel-cased propellant charges for both the HEAT and HE ammunition fired from the "Grom" cannon are very small and they are located on the turret floor, making them very difficult to hit. The ammunition stowage simply does not meet modern standards of safety, not to mention that the overall design of the BMP-1 itself is now completely outdated, but the level of safety was quite typical for armoured vehicles of the late 1960's and was not unusual by those standards. Any IFV, modern or otherwise, would burn up if its ammunition were directly struck by an anti-tank weapon. Take the AMX-10P as an example: it carries 325 rounds of 20mm ammo in the turret, plus another 475 rounds in the hull. Another 10 MILAN missiles may be carried. The Marder 1 also carries 1,250 rounds of 20mm ammunition in the turret and hull as well, along with its stock of MILAN missiles. It is no different with the Bradley, as it carries hundreds of 25mm rounds in the turret, a few TOW missiles and a Dragon missile in the passenger compartment. If any of these vehicles were to be hit anywhere across the side of the hull with an RPG grenade, the missiles or ammunition will be hit, and will probably begin to burn. In this context, the BMP-1 is not much different from any other design of its time. 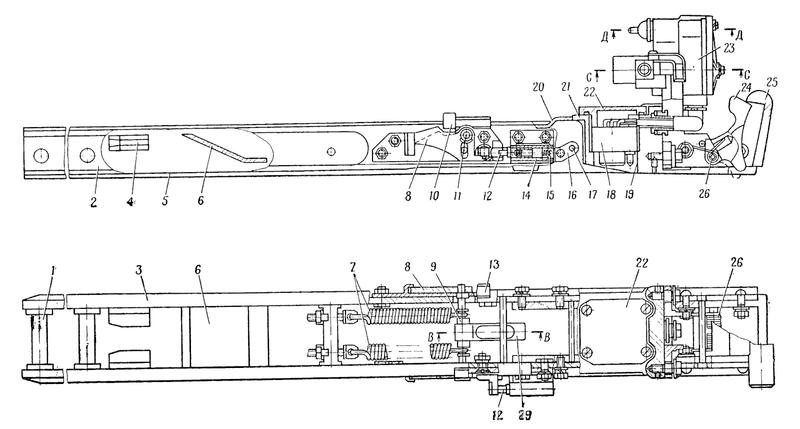 The autoloader was omitted from the Object 765 sp.3 variant of 1973. The reason for this was the introduction of OG-15V high explosive fragmentation rocket grenades. 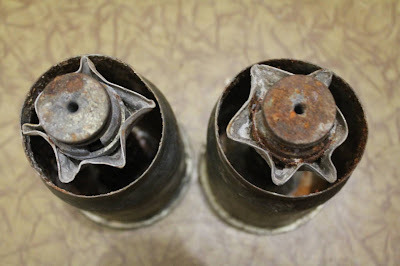 OG-15V rocket grenades were too short to be picked up by the autoloader arm, and the autoloader system lacks the ability to identify and differentiate between ammunition types, as there is no memory unit and no ammunition type selector. When the gunner presses the "load" button, the carousel will cycle one step, and the autoloader will pick up whatever is next in line and load it. Since OG-15V is too short for the autoloader, it will fail to load, and the gunner will have to wait until the cycle stops and load the round manually, and then repeat. This would mean that if he wanted to use high explosive ammunition, he would have to continually load and unload the cannon until he reaches it, and then, load them by hand. Additionally, it turned out that the gunner could manually load the grenades quicker than the autoloader anyway, although this was not an ideal solution as the gunner would be somewhat overworked. Although the autoloader issues could have been solved with an upgrade, one can still understand why they made the decision they did. The median rate of loading by hand appears to be 4 to 5 seconds. It seems to be an improvement, but this comes at the cost of increasing the gunner's workload. As the commander of the BMP-1 may dismount along with the passengers, the gunner may find himself heaped with the responsibilities of three crewmen - commander, gunner and loader, all in one. Needless to say, the combat effectiveness of the BMP-1 is generally not at the same level as a fully fledged tank like the T-54 despite being equipped with sights of equivalent utility and ammunition that was capable of defeating the armour of any contemporary NATO tank from the front. Of course, by not having an autoloader, it became possible to easily lapload the 73mm gun. In the particular example below, three rounds were fired in nine seconds and a total of five rounds were fired in around half a minute with aiming and fire correction. Presumably the gunner prepared a few rounds on his lap instead of drawing one from the autoloader carousel for each shot. The original video is available here (link). Replenishing the carousel is done by hand. It takes only a few minutes to stock up a full load of 40 rounds due to the compactness of each 73mm cartridge. The usual load out (post 1974) is 16 HE-Frag and 24 HEAT. Between 1966 to 1974, all 40 slots in the autoloader conveyor were taken up by HEAT rockets. As one would expect, the load out can change depending on the tactical situation. The only real difference between the ammunition for the "Grom" and the "Kopye" is the means of propulsion - whereas PG-9 rockets were to be fired from an open-ended tube that is the SPG-9 recoilless gun, the PG-15V is fired from a closed-breech gun. Without needing to vent out most of the expanding hot gasses of the propellant charge out the back of the gun tube like in the SPG-9, it became possible to reduce the propellant charge without facing a reduction in muzzle velocity. The mass of the propellant charge in a PG-15P charge is only 0.16 kg. The small size of the PG-15P is a crucial benefit in the small one man turret, helping to reduce the total length of the rocket to acceptable limits. The coupler assembly for both the PG-9P and PG-15P can fit the standard PG-9 grenade and warhead assembly. It is possible for a PG-9 grenade to be converted to PG-15V rockets by simply swapping out the PG-9P propellant charge for the PG-15P. The coupler is designed to ignite the tracer and begin the rocket motor fuze via transferring the primer ignition spark. When fired, the top lid of the PG-15P charge is breached by the pressure of the rapidly expanding propellant gasses and the charge casing expels the gasses into the cannon chamber. As shown in the photo below, the top lid of the charge casing is breached upon firing, but the lid is deformed in such a way that the passage from the casing to the cannon chamber and the barrel is restricted. This reduces the rate of pressure release and thus reduces the chamber pressure by some amount, which translates to a small reduction in the recoil impulse of the cannon. 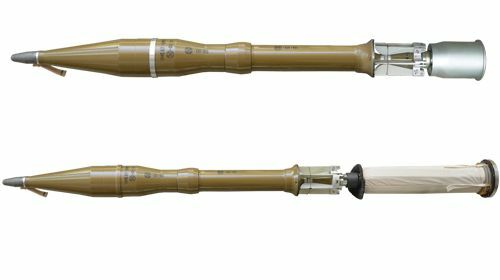 The PG-15V cartridge combines the PG-9 rocket grenade assembly used by the SPG-9 with the proprietary PG-15P propellant charge. The PG-9 is a dual-purpose rocket grenade originally intended for the anti-armour role, but was initially used for anti-personnel purposes as well because of a lack of other options. 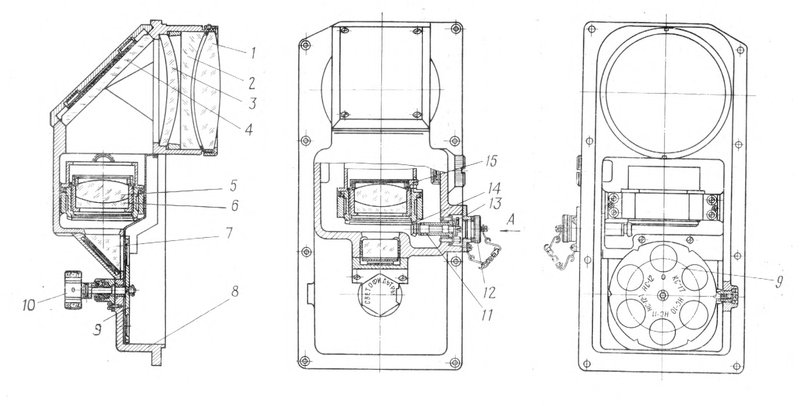 With its PG-9G shaped charge warhead and thin casing, the PG-9 grenade is most efficient against armoured vehicles, but BMP-1 gunners were instructed to use this round against infantry in the open and in fortified positions for lack of a better option until the OG-15V round became available. 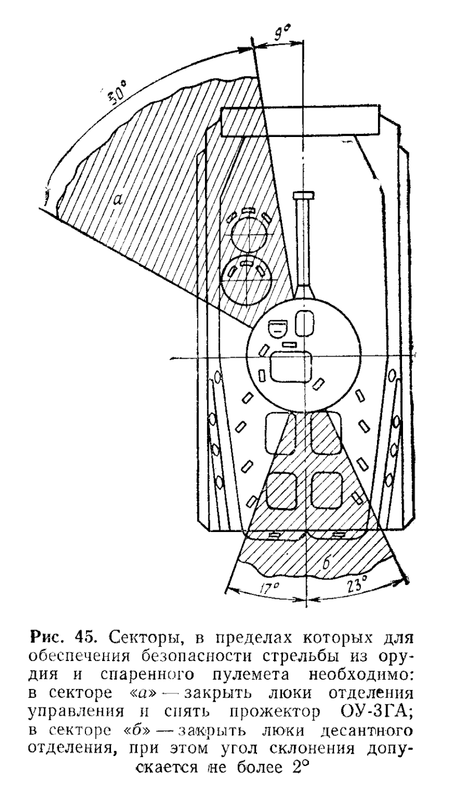 The rocket engine is located at the rear of the projectile, in front of the folding stabilizer fins. Rocket propellant is contained inside the cylindrical segment at the middle of the projectile and the exhaust gasses exit from a Venturi nozzle at the rear end of the projectile, unlike an RPG-7 rocket where multiple exhaust nozzles are arranged around the circumference of the rocket just behind the grenade warhead. A raised lip in front of the stabilizer fins acts as an obturator. The casing of the PG-9G warhead is made from aluminium and weighs only 0.9 kg. A light aluminium casing does a rather poor job at creating fragmentation compared to steel, and is used in offensive hand grenades like the RGN for this reason. The lack of fragmentation effect makes the PG-9 highly anemic against infantry situated on open ground, but the 0.322 kg explosive charge can still cause significant damage as it is equivalent to a 0.515 kg TNT charge. It can be inferred that if used on infantry, the PG-9 grenade would be most useful against fortifications such as sandbag and log bunkers. The shaped charge would be able to perforate fortifications that would otherwise stop a 12.7mm or 14.5mm bullet, and the blast effect could reduce the structure to an unusable state. The lackluster quantity and energy of its fragmentation makes the grenade unsuitable against troops in the open, and especially against troops equipped with flak vests. Under such circumstances, the BMP-1 gunner will have to rely mainly on his PKT coaxial machine gun. Since the introduction of the OG-15V in 1973, the PG-15V was relegated to a backup role against non-armoured targets. It would only be used if OG-15V is observed to be ineffective against a given target. 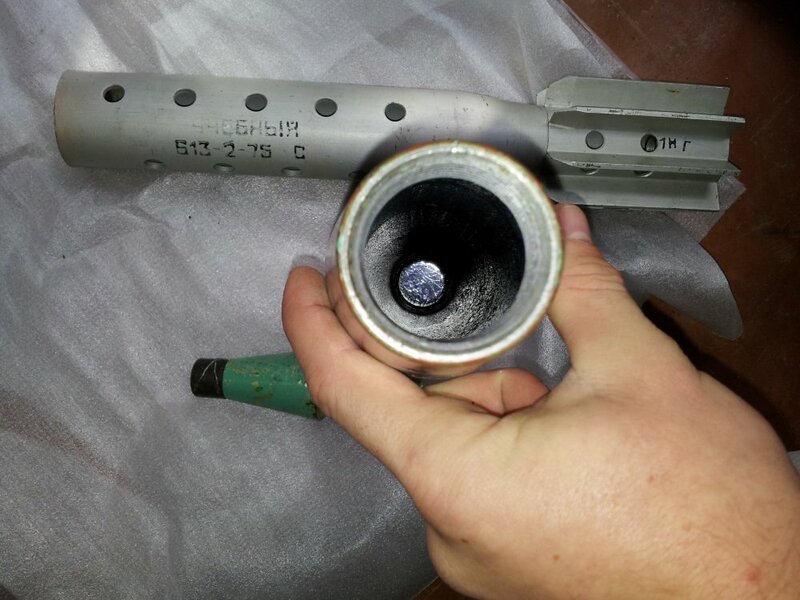 Officially, the PG-9 grenade warhead penetrates 300mm of RHA steel, but this figure actually indicates the thickness of armour that can be perforated with a significantly destructive post-perforation effect. This effect is provided when a certain amount of armour overmatch is included. 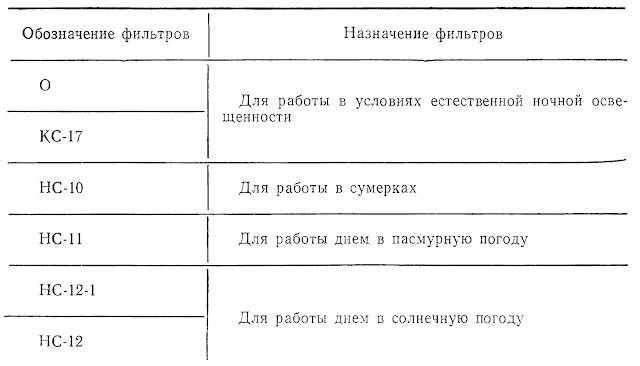 According to a 1979 Soviet report titled "Выбор Кумулятивных Снарядов Для Испытания Брони" (Selection of Cumulative Shells for the Evaluation of Armour), the average penetration of the PG-9 warhead in RHA reaches 326mm. The maximum penetration is 346mm and the minimum penetration is 302mm. This criteria is not shared by all militaries. The penetration figures for various shaped charge weapons reported in official U.S Army publications such as in TRADOC bulletins often align with the maximum penetration recorded during tests. This seems to be the main reason why the penetration of the 66mm LAW is reported to be 330mm. If both the LAW grenade and the PG-9 were compared under the same criteria, it would be extremely unlikely for the smaller caliber LAW grenade to outperform the PG-9, let alone by such a large margin. In theory, the PG-9 grenade was fully capable of reliably defeating the frontal armour any NATO tank that it was expected to encounter in a major European war during the period of influence of the BMP-1, including tanks such as the M60A1, AMX-30, Leopard 1 and Chieftain. Even when NATO obtained a numerically relevant quantity of next-generation tanks like the Leopard 2 and M1 Abrams in the mid-1980's, the large number of legacy tanks serving in the ground forces of NATO militaries allowed the BMP-1 to stay relevant with the PG-9. However, the small margin of defeat against the front of heavily armoured tanks such as the M60A1 and Chieftain makes the PG-9 an unreliable weapon. The ballistic performance of PG-9 is quite good for a grenade of its class. Because of the very high velocity of the rocket grenade, it takes only 1.32 seconds to reach a target at 700 meters. This makes it easier to hit a moving target compared to a low velocity round. 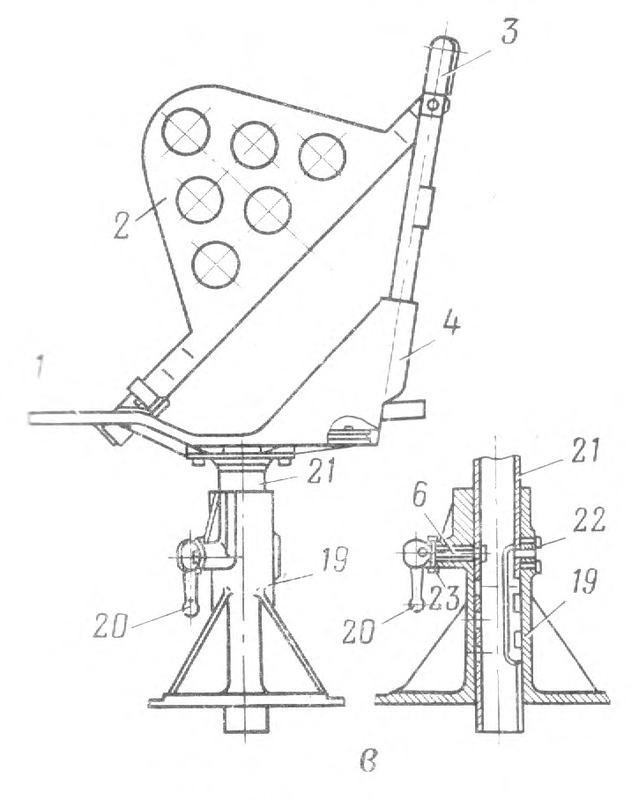 A firing table for the PG-9 round is shown below. 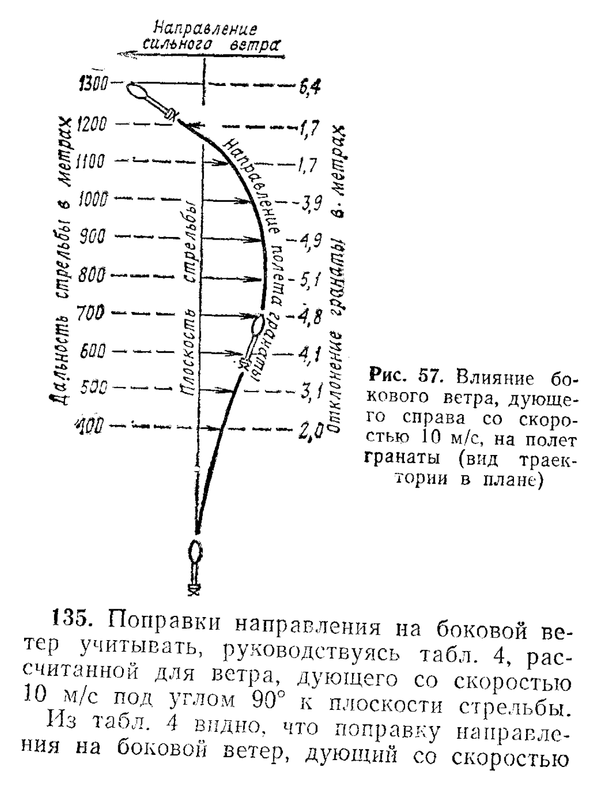 The first column is distance in meters (in meters), the second column is angle of gun elevation (in degrees), the second is the height of drop (in meters), the third is the total flight time (in seconds), and the fifth column is the speed of the rocket grenade (in meters/second). As you can see from the table, the grenade remains supersonic up to 900 meters and slightly further, and the ballistic drop is less than a meter at a distance of 500 meters, and it takes only 0.9 seconds for the grenade to reach its mark at 500 meters. One of the peculiarities of rocket-propelled grenades like the PG-9 is that the deflection dynamics of the projectile from crosswinds will change depending on the state of the rocket engine. When the projectile is still experiencing acceleration from the rocket engine, it accelerates against the direction of the crosswind. In other words, if the crosswind is blowing from right to left, the projectile flies to the right. Once the rocket engine burns out completely, the projectile begins to decelerate and it behaves like a typical fin-stabilized projectile in the cross wind, which is to say that it flies in the direction of the wind. 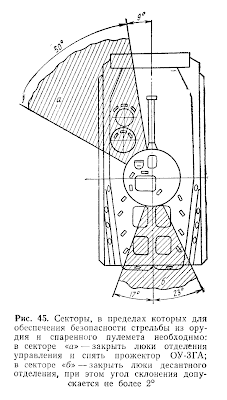 For the PG-9 round, the rocket engine burns out in only a fraction of a second and as such, the projectile ceases to accelerate against the crosswind and begins to normalize in the opposite direction. 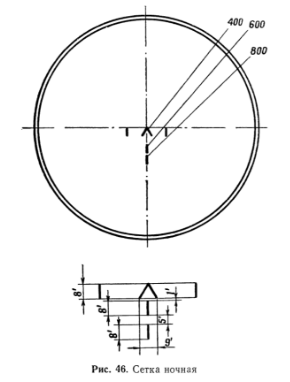 At 800 meters, the projectile is completely normalized and is oriented parallel to the bore axis of the cannon, and beyond 800 meters, the projectile becomes deflected into the crosswind. 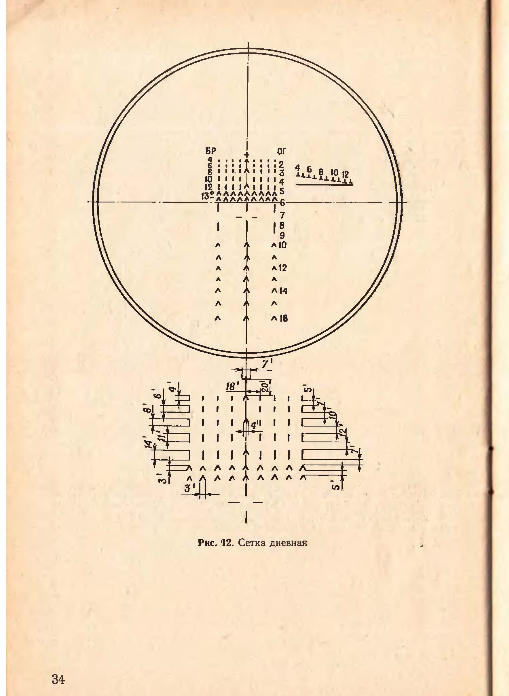 These non-intuitive flight characteristics make it extremely difficult to engage targets at ranges beyond 800 meters as the gunner is expected to mentally apply corrections for this phenomenon without the aid of any instruments except the markings in his sight. The firing table for PG-9 as fired from the "Grom" shows that the maximum deflection from a 10 m/s crosswind is 6.5 meters at a distance of 500 to 600 meters. Beyond this range, the trajectory of the projectile reverses direction. At 1,150 meters, the point of impact coincides exactly with the point of aim. Fortunately, because the maximum effective range against tanks is limited to 800 meters, the reversal in the flight direction of the PG-9 grenade in a crosswind at beyond 800 meters is practically irrelevant. The gunner would only need to apply the basic - and more intuitive - windage corrections when firing at virtually all point targets. Soviet-era stocks of PG-15V rockets have long since expired, and production for domestic use in Russia has shifted towards the improved PG-15VN for equipping the extremely meager collection of various leftover BMP-1s still in service in rear echelon forces. 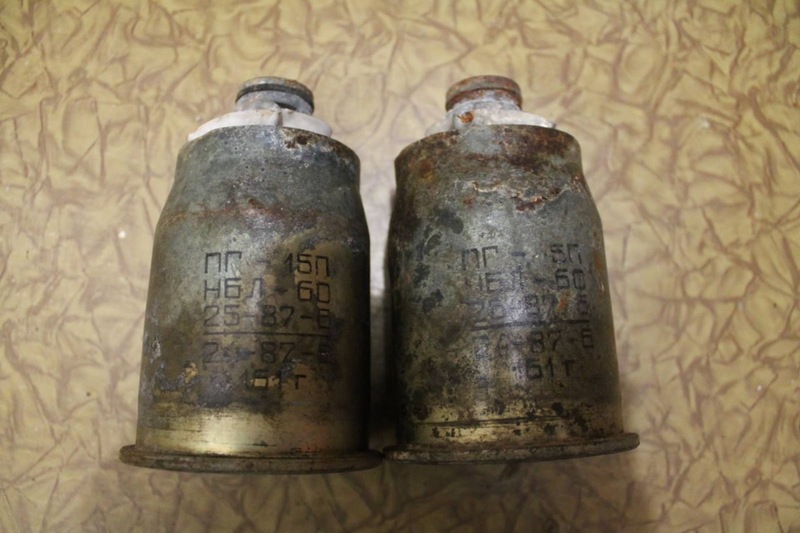 Since 1999, the Planta chemical plant in Russia has been proceeding with its munitions recycling program designed to reintroduce expired Soviet-era HEAT grenades back into the Russian Armed Forces. 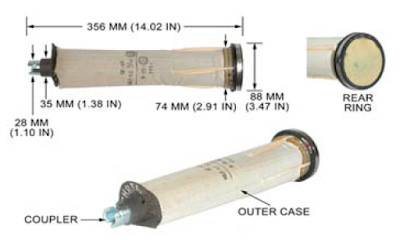 Up to 75% of all non-perishable components (including the casing, booster assembly, shaped charge liner, fuze, etc.) could be kept and reused with new rocket propellant and a new explosive charge. It is quite likely that recycled PG-15Vs have been modified with a more powerful OKFOL filling to have PG-15N warheads. The PG-15VN round with the PG-9N grenade features an improved warhead with a more powerful OKFOL explosive charge instead of A-IX-1. OKFOL is composed of 95% HMX and 5% of phlegmatizing wax. All other parts are identical and all characteristics except for armour penetration performance are identical to that of the PG-9. As such, the 1PN22M1 sight does not need to have a new viewfinder markings disc to be compatible with the new ammunition. PG-15VN formally replaced the PG-15V in 19, and if stocks were available, a BMP-1 would have PG-15VN rounds loaded exclusively. The remaining BMP-1P vehicles still in use in the Russian Army are armed with PG-15VN rounds. Ballistically, the OG-9 grenade is similar to a mortar shell since it lacks a rocket motor. Compared to the PG-9, it is also quite a bit heavier. Because of this, it is subsonic, with a muzzle velocity of just 290m/s. Unlike the four long flip-out stabilizing fins of the PG-9 rocket grenade, the eight stabilizing fins on the OG-9 have a much smaller wingspan and gives the grenade the ballistics of a mortar bomb. Firing tables show that in a 10 m/s crosswind, an OG-9 grenade is deflected by 3 meters. The OG-9 warhead uses the GO-2 superquick fuze. As OG-9 is significantly shorter than PG-9, it is easier to load by hand. 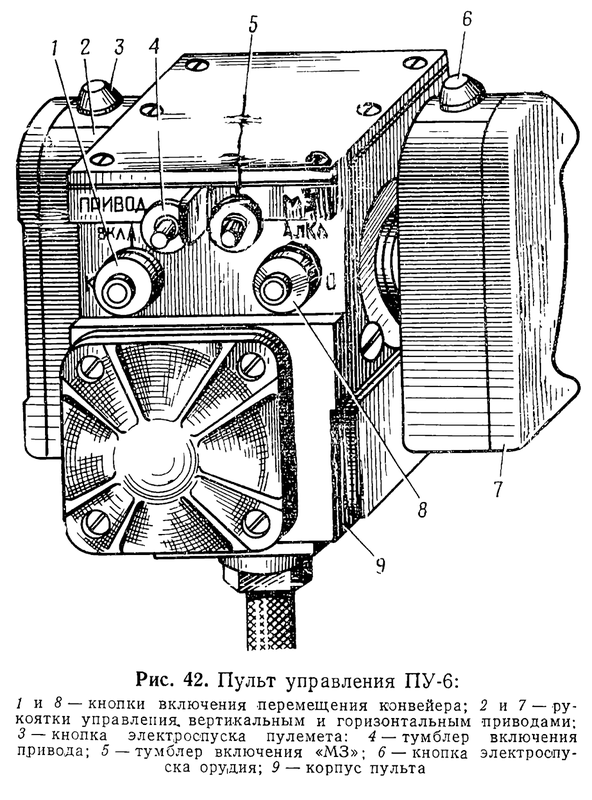 The GO-2 fuze is covered by a protective cap that can be removed prior to firing. When the OG-9 grenade is fired with the cap on, the fuze has a delay that causes the grenade to function in the HE mode. When the cap is removed prior to firing, the grenade functions in the Frag mode. The need to manually set the fuze mode is one of the reasons why the autoloader of the BMP-1 was removed. The OG-9G warhead of the grenade has a 0.73 kg filler of A-IX-1. The explosiveness of A-IX-1 is 1.58 times higher than TNT. This is quite good, but it is still slightly lower than pure hexogen due to the presence of a wax phlegmatizer to stabilize the explosive compound. In terms of explosive effect, the OG-9G warhead is equivalent to 1.15 kg of TNT. Like the PG-9, the OG-9 grenade uses the same PG-15P propellant charge. The grenade body has a perforated tube section in lieu of a rocket motor. 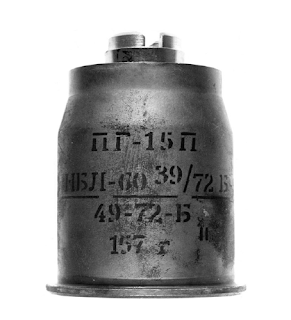 When the PG-15P charge is detonated, the perforated tube of the grenade fills with expanding gasses which results in a reduction in chamber pressure. 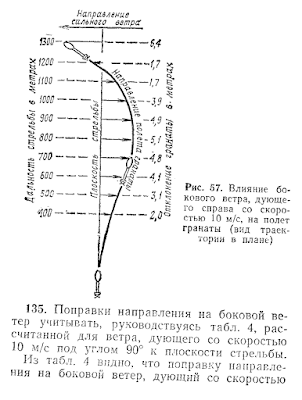 Due to the low muzzle velocity and the lack of a rocket motor, the OG-15V has a very pronounced arcing ballistic trajectory, similar to a mortar shell. The OG-9G warhead is more or less equal in power to an 81mm or 82mm mortar bomb in terms of explosive payload. It is also worth mentioning that the OG-9 grenade is launched at around the same velocity as a typical mortar bomb, except that the poor gun elevation of the 2A28 cannon restricts its ability to perform long range indirect fire with the BMP-1. The closest counterpart to this unique combination is the M20 recoilless rifle firing the spin-stabilized M309 HE shell, but the M309 is a modification of the tank-fired M48 shell of WWII vintage. The casing of the steel warhead is 2.83 kilograms in weight. The walls of the warhead cavity can be seen in the photo below. Photo by RaiderBox. With a TNT equivalence of 1.15 kg, the mass of the filler is 40% of the mass of the steel casing. The mass of the explosive charge is quite large for a grenade of its caliber, but the thickness of the steel casing is considerably less than a tank-fired HE shell of a similar caliber. For comparison, the steel casing of the M309 HE shell weighs 5.35 kg. Although the OG-9G grenade is primarily intended for the anti-personnel and anti-fortification role, they can also be effective against lightly armoured vehicles and soft-skinned vehicles. The photo on the left is from the 15th Artillery Field Regiment website and shows an M113 hit by a B40 anti-tank grenade launcher (RPG-2 clone). The photo on the right is from the Australian War Memorial website and shows a destroyed Australian M113A1 from the Vietnam War. According to the AWM, the vehicle was hit three times by 75mm recoilless rifles during Operation Bribie on the 17th of February 1967. In both photos, it is simple to deduce that the large breaches in the armour were caused by an external explosion because the edges of the armour plate around the breach are bent inward. The second example is the most interesting because one of the 75mm recoilless rifle rounds struck the passenger compartment roof hatch which was open at the time, and the damage done to the 38mm-thick hatch can be clearly seen. The engine of the M113A1 was destroyed by another round from the recoilless rifles. Note that the 75mm M309 HE shell fired from the M20 recoilless rifle only has 0.676 kg of TNT as its explosive filler and the projectile is launched at a muzzle velocity of just 302 m/s. The OG-9 grenade is launched at practically the same muzzle velocity but the explosive charge of its warhead is equivalent to 1.15 kg of TNT. The heavier steel casing of the M309 is irrelevant in this comparison as it is the blasting power of the shell that caused the damage to this M113 and not fragmentation. Although HEAT rounds are usually the ammunition of choice when grenadiers are facing armoured vehicles, it is clear that even medium-caliber high explosive shells launched at low velocities can defeat armoured personnel carriers and other vehicles with a similar level of armour protection. With this in mind, it should be understood that the addition of HE rounds as a new ammunition type to the repertoire of the BMP-1 in 1974 did not necessarily result in a trade-off of anti-armour capabilities in exchange for enhanced anti-personnel and anti-fortification capabilities. Rather, the overall firepower and flexibility of the BMP-1 saw a general increase. The OG-15VM grenade became available later on. It was an improved version using a more powerful A-IX-2 explosive charge instead of A-IX-1. This improved the blasting power of the warhead and added an enhanced incendiary effect. Although the coaxial machine gun in most IFVs are usually sidelined in favour of their more powerful autocannons when engaging infantry, the BMP is more often forced to depend on its PKT when dealing with infantry in the open due to the weak fragmentation effects of the 73mm HEAT grenades. The PKT is mounted to the right of the 73mm 2A28 "Grom" cannon, as it feeds from the right and ejects to the left. Spent shell casings and link segments fall through a chute and into a metal bin to be collected. This bin is the same one that collects spent casings ejected from the main cannon, but in a different compartment. Unlike the co-axial machine guns featured in Soviet tanks and armoured personnel carriers of the time, the coaxial machine gun in the BMP is fed from an unusually large 2,000 round box, as you can see in the diagram above. As the BMP must make use of its PKT regularly, the large capacity box is very convenient. Looking abroad, however, it is clear that this was not much of an innovation for 1967. The Marder 1 and the AMX-10 both have coaxial machine guns fed with 2,000-round boxes, and both have a 20mm autocannon as their main armament, so the BMP can only be considered on par with its contemporaries in this regard. 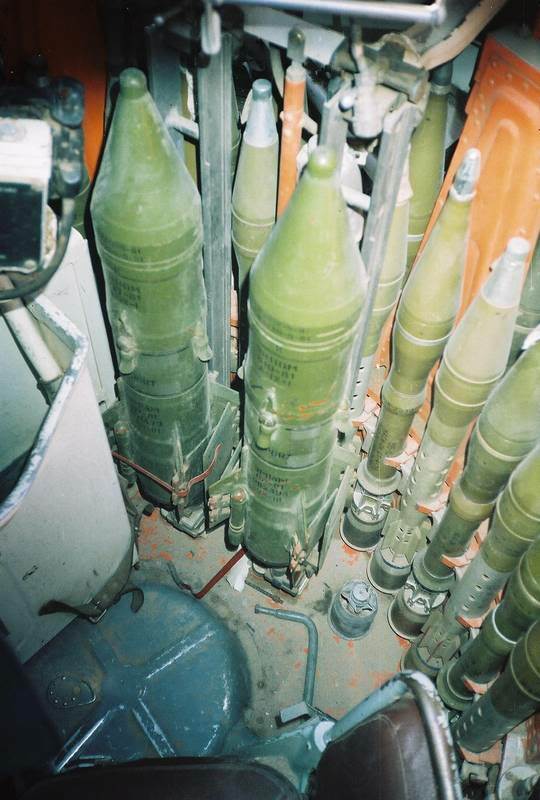 The BMP carries additional boxes of machine gun ammunition, but those boxes are meant for hand-held PK and PKM machine guns and cannot be readily used by the coaxial machine gun, as there is no mounting point for 250-round boxes, although it is still possible to load a full belt and leave it hanging - the PK series reportedly has an exceptionally strong feeding mechanism. Armour piercing incendiary rounds and armour piercing incendiary tracer ammunition is usually loaded in a 4:1 ratio. The PKT machine gun has a cyclic rate of fire of around 800 rounds per minute, and it has a thicker barrel than the infantry-based PK to allow for longer periods of sustained fire. 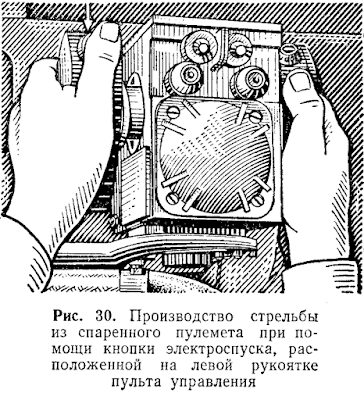 There are two ways to fire the PKT: tthe left thumbswitch on the "Cheburashka", or by depressing the manual trigger lever on the back of the machine gun, on the firing unit just behind the disassembly button. In 1969, the PK was replaced by the PKM and the corresponding sub-variants were also replaced with modifications of the PKM, including the replacement of the PKT with the PKM. The PKTM is mainly distinguished from the earlier PKT by the smooth barrel as opposed to the fluted barrel of the PKT. Internally, the PKTM and the PKT differ in the same way that the basic PK and PKM models differ. At the time of the BMP-1's introduction, the "Malyutka" ATGM system was already quite widespread and posed a a very serious threat to NATO armour. 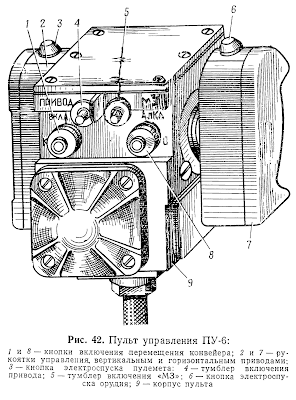 It was analogous to earlier Western ATGMs, and was appreciated in a similar way as man-portable missiles and dedicated anti-tank missile platforms by the Red Army, but the most significant point to mention about the "Malyutka" on the BMP-1 was that it was the first ATGM to be comprehensively incorporated as part of the primary armament of this class of combat vehicle. 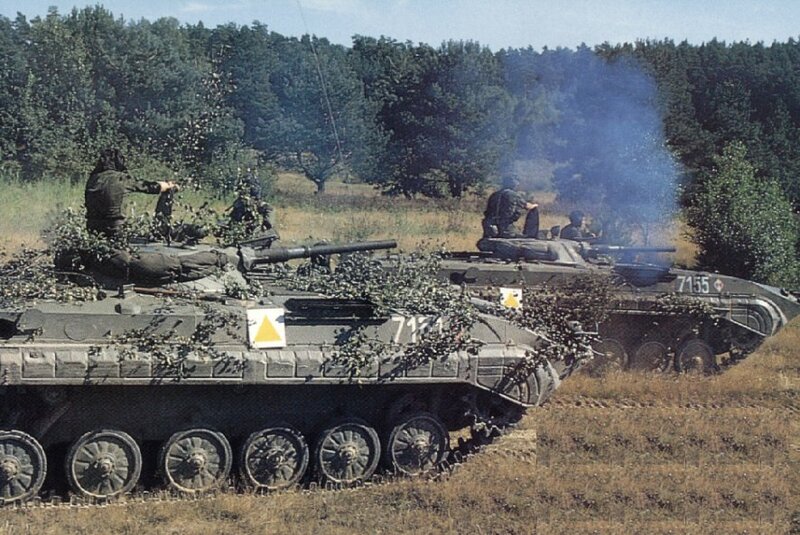 This was one of the reasons why the BMP-1 is often said to be more qualified as the first true IFV instead than the Schützenpanzer 12-3 which came much earlier, despite the fact that the Bundeswehr had developed mechanized infantry tactics centering on the IFV concept to go with the SPz 12-3 before the Soviet Army. 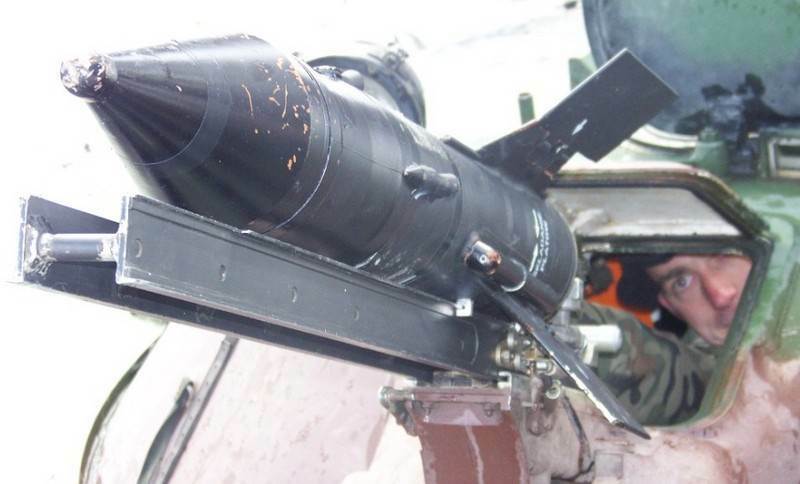 Control of the "Malyutka" missile is achieved using the 9S428 control system which includes the analogue electronic components of the control joystick for the gunner and the electrical connections that connect the missile to the launching system on top of the barrel of the "Grom" cannon. The missile comes assembled with a lightweight I-beam launching rail that fits into the launch platform on top of the cannon barrel. To load a missile, the gunner must elevate the cannon to its limit of +30 degrees, open a small hatch in the turret roof directly above the cannon breech, and mount the missile onto the launch platform from there. To align the missile launch rail with the launch platform, the gunner aligns it on top of a pair of rollers on top of the "Grom" cannon breech before pushing the entire assembly forward. The "Malyutka" launch platform contains electrical connectors that joins the missile guidance system to the missile guidance wire through the launch rail. The two photos below show "Malyutka" missiles mounted properly on the launch platform. The missile has its fins folded for stowage and to fit through the hatch, so the gunner needs to unfold them after loading it. The fins impart a slow spin of 8.5 RPM to the missile to help stabilize it. This rate of spin is far too low to have any affect on the performance of the HEAT warhead. After a missile is launched, the launch rail remains on the launch platform, and must be manually removed by the gunner before the next missile is loaded. 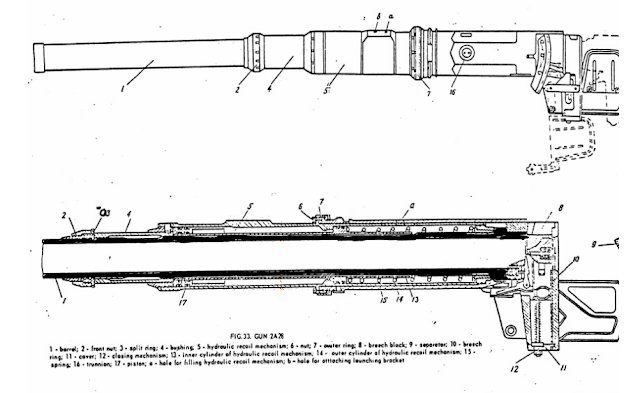 The launch rail would be reused when replenishing the ammunition supply of the vehicle. 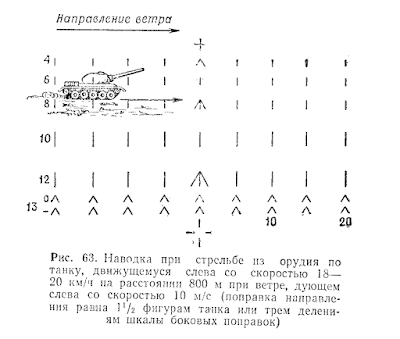 The BMP-1 manual does not say what the rate of fire is, but based on the time of flight of 25 seconds to reach the maximum engagement distance of three kilometers, the rate of fire in the first minute after target detection should be around 1 round per minute, considering that a BMP-1 would not have a missile kept on the launch platform before combat. If a missile is already on the launch platform before the gunner detects a target, two missiles can be fired in the first minute at a target at the maximum range of three kilometers. At shorter distances, a slightly higher rate of fire can be expected. When launching a missile, the cannon should be elevated to provide the necessary ground clearance to allow the missile to stabilize during flight. The correct elevation is achieved by the gunner placing the crosshair at the bottom of the 1PN22M1 sight viewfinder on the desired target. 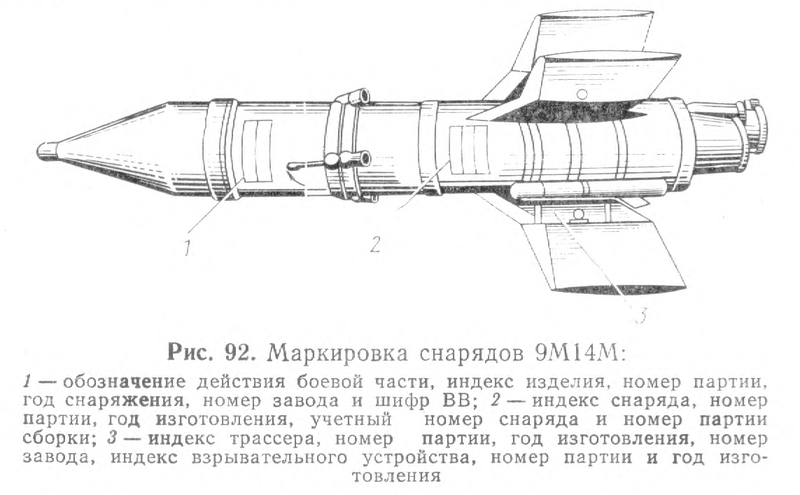 The "Malyutka" had the perfect balance of weight and destructive power for a man-portable missile. It did not have the most powerful warhead among its Soviet cousins, it was not the fastest flyer, and it wasn't the cheapest to make either. It could, however, still penetrate any NATO tank from the front, but was relatively light at 10.9 kg, and it was still faster than any NATO contemporary. Its light weight and small dimensions lent itself quite well to relatively quick and easy loading from within the confines of the turret. Arguably easier even in comparion to later IFV designs like the Bradley, which forced a passenger to load TOW missiles weighing in excess of 21 kg from the passenger compartment through a large roof hatch. The Bradley could not reload its missiles at all either if no passengers were around to help. For what it's worth, that is a praiseworthy feature of the BMP-1. 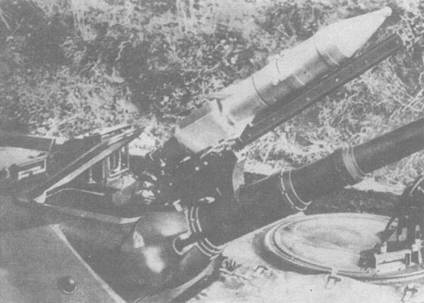 The "Malyutka" gained fame for its smashing performance in the early stages of the Yom Kippur war, and for its surprise appearance near the end of Vietnam, where it was most useful as a high mobility, man-packed "long arm" for dislodging recoilless rifle emplacements and reinforced bunkers, but what made the "Malyutka" both feared and respected was how it could easily punch through tanks like no other weapon in the North Vietnamese arsenal. On the 23rd of April in 1972, several kilometers west of Dong Ha, the 2nd Squadron of the 20th Tank Regiment came face to face with this weapon and lost one M48A3 tank and one M113 APC, with another M113 damaged. 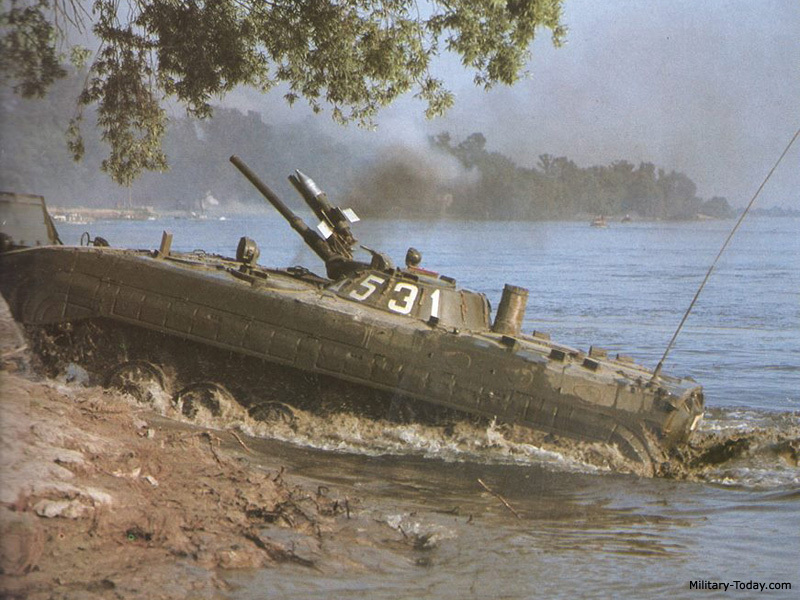 Four days later on the 27th of April, three more M48A3 tanks were lost to "Malyutka" missiles in the midst of a renewed North Vietnamese attack along the Mieu Giang Cua Viet River defense line. Another noteworthy use of the "Malyutka" in Vietnam at the same period was the PAVN assault on the Tan Canh base camp on the 23rd of April, 1972. In Tan Canh, the first ARVN casualty was an M41 tank belonging to the 1st Squadron, 14th Cavalry returning to the camp through the main gate. It was hit by a "Malyutka" missile, which completely obliterated it. The reinforced bunker was hit next, killing or wounding several staff members and officers within. The remaining M41 tanks in the compound were then wiped out one by one with Malyutkas. More information on these engagements can be found on the Wikipedia pages for the aforementioned base camps, and on here (link). 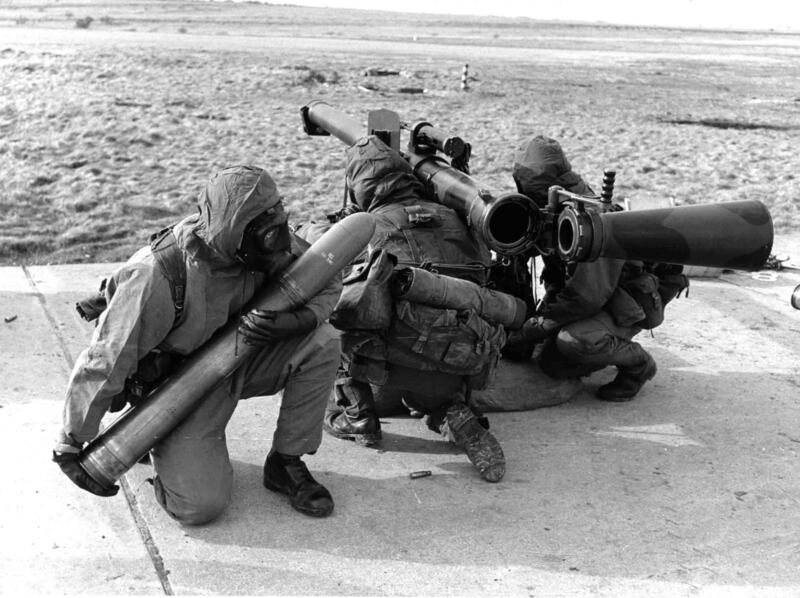 Egyptian Malyutkas made their mark during the Yom Kippur war. 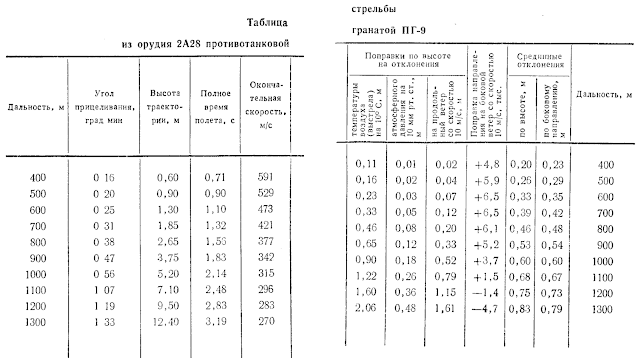 The book "The Egyptian Strategy for the Yom Kippur War: An Analysis" by Dani Asher mentions that the quantity of Malyutkas supplied to the Egyptians by the USSR was enormous. Each division was provided with sometimes as many as 1,250 missiles in the first three days of fighting, and up to 460 missiles on the first day alone. These missiles were primarily used in two ways: man-pack teams and 9P133 tank destroyers based on the BRDM-2. The 230 BMP-1s in Egyptian hands were also stocked with "Malyutka" missiles. Asher states that Israeli intelligence was aware of the threat posed by these missiles and knew that the Egyptians were receiving them, but that for some reason, this information did not seem to have filtered down to IDF units. The Syrian experience with the "Malyutka" as an integrated component of the BMP-1 was mostly negative, owing to "the difficulty in guiding the missile from within the confines of the turret". However, seeing as the Syrians only received their shipment of BMPs in late 1973, this can be firmly chalked up to operator incompetence. 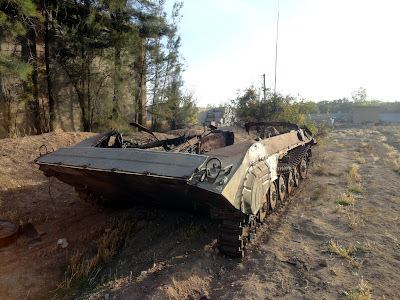 Zaloga's "BMP Infantry Fighting Vehicle 1967–94" even mentions that the Israelis destroyed or captured about 50 to 60 Syrian BMP-1s, and that about half of them were abandoned due to mechanical failure. Since the Syrians only committed 100 out of a total of about 150 of their BMPs to combat, Zaloga presumably means that the captured BMPs were only captured because they were abandoned, or at least that most of them were. We know from Soviet field exercises and recent experiences with the BMP-1 (particularly from Syrian crews participating in the civil war today) that it is extremely reliable, so the only possible conclusion is that the Syrian BMP crews of the Yom Kippur war were simply undertrained just like their Egyptian counterparts. It follows that the gunners were also under-trained in the operation of the "Malyutka" missile system. 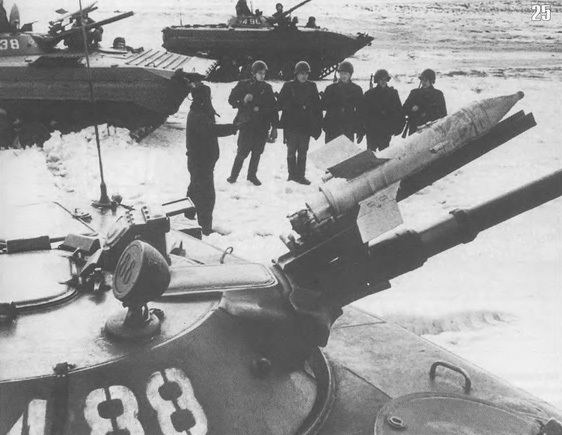 As the "Malyutka" requires quite a lot of practice to use effectively (and even then, "effective" is a relative term), the lack of sufficient training would be a huge detriment to the combat effectiveness of the missile under any circumstance, regardless of whether it is fired from a BMP-1 or a 9P133. Control of the "Malyutka" missile is MCLOS only, and that means that the gunner must steer the missile manually as it flies through the air. This is done via the 9V332 missile systems control box, which has a joystick to steer and a button to launch the missile. 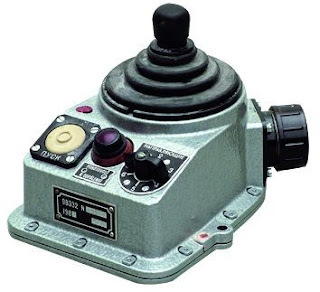 When not in use, the joystick is retracted inside the control box. To use it, the joystick is extended first. The 9V332 missile systems control box was originally designed for the BRDM-1 tank destroyer. The black dial you see in the photo above was meant to allow the gunner to select the desired missile out of the six on the overhead launch rails. 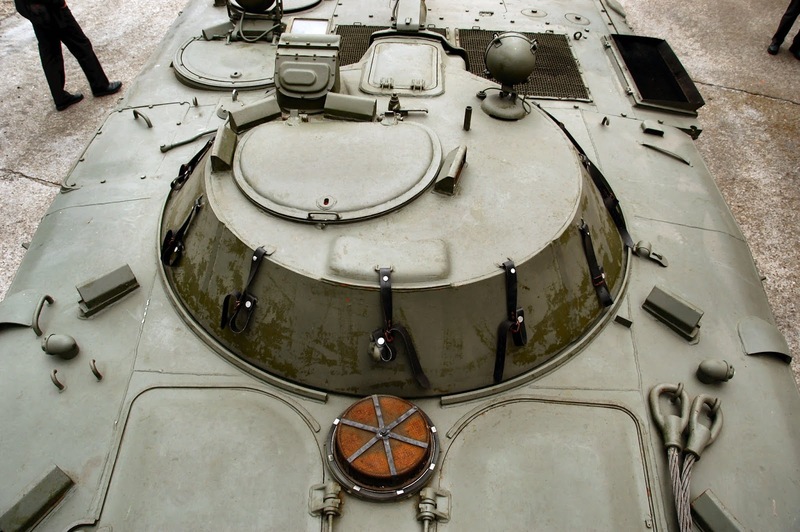 As the BMP-1 can only mount one missile at a time, the dial is permanently set at the number one position. The milky white button is the launch button. The purple bulb in the center of the box is the missile status indicator. If the bulb does not light up, it means that the missile is either not mounted, not mounted properly, or malfunctioning. The control box is installed on a hinged pedestal. When not in use, the box is stowed away by swinging the pedestal underneath the gunner's seat. The "Malyutka" had the same idiosyncrasies as any other MCLOS missile of its era, but there is a ring of truth to the claim that the "Malyutka" is inherently more difficult to use in the BMP. The 1PN22M1 and 1PN22M2 sights have a rather limited magnification and field of view. 6.7x is more than enough for using the "Grom", which is effective out to 500 meters, but the Malyutka's 3000-meter maximum range cannot be fully exploited. In this aspect, the man-pack version of the missile (pictured below) with its 9Sh16 periscopic sight with its 8x magnification is objectively superior, and the field of view of 22.5 degrees that it offers is much better than the 6x magnification and the field of view of 15 degrees of the 1PN22M1 sights in the BMP-1. However, even if the BMP-1 is at a minor disadvantage here, it still isn't enough to neuter the "Malyutka" as the missile can still be used at its maximum range without any real issue. Technically, the "Malyutka" cannot be used at night at all, as the nightvision module of the 1PN22M/M1/M2 sight is only useful up to 400 meters. However, gunners can guide the missile towards the light emitted by the spotlights or headlights of enemy vehicles using the flare of the rocket engine. The ideal target would be the spotlight of an enemy tank as that would be clearly visible through the night sight, but tank gunners are trained to illuminate targets with their spotlights intermittently rather than keep it on for prolonged periods. 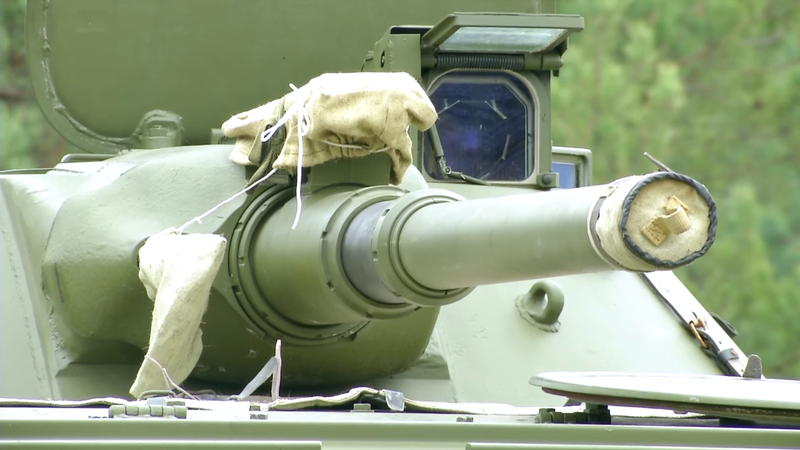 As such, the only light source that remains activated long enough for a "Malyutka" operator to guide his missile at night would be the headlights of the target. Simulated firings were preferred over live fire training sessions for obvious reasons. 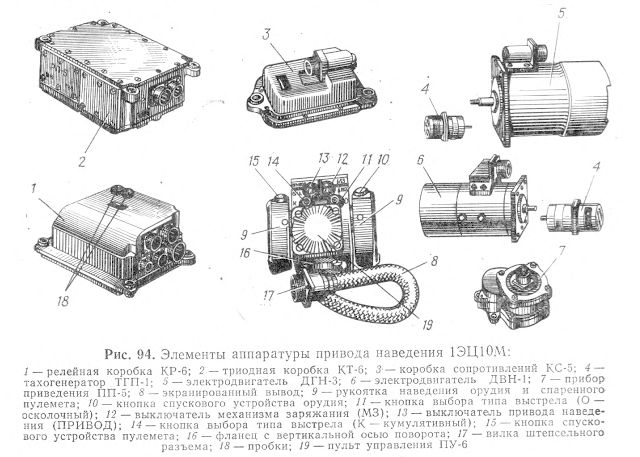 Each "Malyutka" missile contains expensive components, with the internal gyroscope being the most expensive and valuable of all. Still, the rate of production of Malyutkas was extraordinarily high, so that they were never in short supply throughout the Warpac nations. In the Red Army, though, most of them were kept in reserve storage "for a rainy day". It is said that NATO placed heavy emphasis on their ATGMs as a way of countering the Soviet armoured threat, but honestly speaking, the scale of NATO's implementation and stockpiling of ATGMs are peanuts compared to the Red Army. But I digress. *This information comes from an article penned by Steven Zaloga on Jane's Intelligence Review, published on the 6th of February, 1994. A messy, but intact copy of the article is available here (link). Once missile guidance evolved to the SACLOS type, the lethality of ATGMs went up drastically. 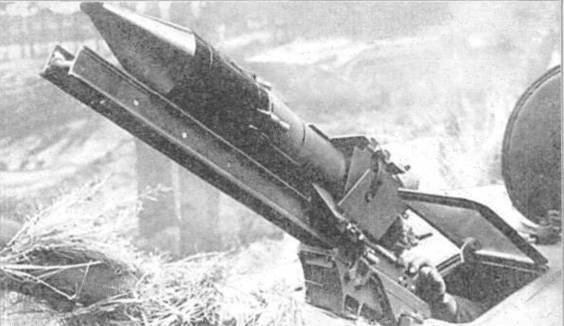 The Hungarian army estimated that a SACLOS "Malyutka" missile had an 80% to 90% probability of scoring a hit. This SACLOS version, designated the 9M14P (or Malyutka-P), was developed and fielded in 1969 - just 6 years after the release of the original model in 1963, but the Hungarian army only received it in 1978. Unfortunately, the BMP-1 never received a fire control system capable of conducting SACLOS guidance, so even if the 9M14P is fired from the BMP-1, the missile can only be guided in its MCLOS mode, which is otherwise reserved for situations where the SACLOS guidance system is either malfunctioning or experiencing interference. In this case, the only benefit is the improved flight characteristics and better armour penetration of the new missile. The only SACLOS missiles that the BMP-1 is capable of fully exploiting are the Fagot or Konkurs. The minimum range of accurate fire for all "Malyutka"-type missiles is 500 meters, and the maximum is 2,500 meters to 3,000 meters. Below 500 meters, the missile does not fly on a level trajectory as the gyrostabilizer has not spun up to its operating rate of spin yet. The gyrostabilizer keeps the missile on a relatively straight path so that it can be steered effectively. For most intents and purposes, a 500-meter radius around the launcher can be considered a dead zone where the missile is basically unguided and uncontrollable. However, an additional 300 meters is needed to gain complete control of the missile over its full flight sector of 15 degrees, so in actuality, the dead zone is 800 meters. This is a fact detailed in the manual, which was the source of the diagram below. As such, the maximum effective range of the 73mm "Grom" is needed to engage any targets that appear at 800 meters or less from the vehicle. 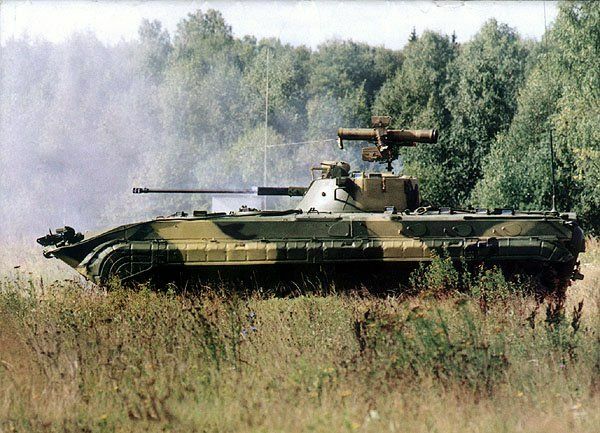 Furthermore, even if a tank-type target spontaneously appears at a distance of between 500 and 800 meters, it is always favourable for a BMP-1 gunner to engage it with his cannon instead of a missile as the reaction time with the cannon is much quicker. The influences of operator stress also tend to impact the probability of hit with the "Malyutka" more than with the "Grom". 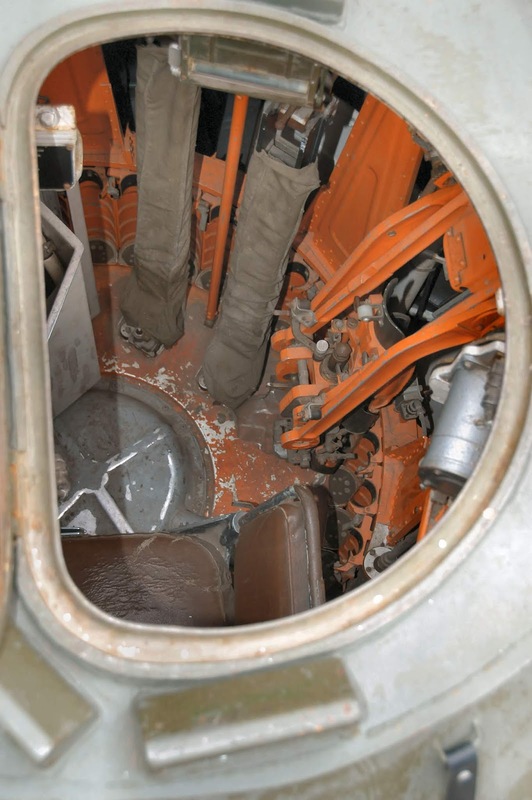 Two ready-to-use "Malyutka" missiles can be stowed on the turret floor, as you can see in the photo below (note the gunner's seat at the very bottom of the photo). This makes it convenient for the gunner to rapidly reload the missile launcher without leaving his seat. 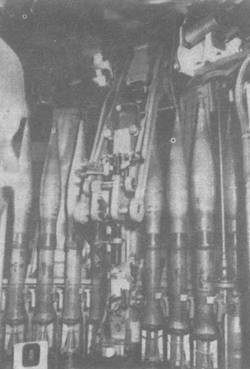 Another two missiles are stowed in the hull on racks mounted to the wall adjacent to the turret. According to safety protocols, the missile launcher should be left unloaded until the missile is needed. It is not permitted to keep a missile loaded on the launcher rail during marches or any other non-combat operation for fear that it may be damaged, as the missile is completely unprotected. The BMP-1 was never issued with the original 9M14 model. The improved 9M14M model was the basic variant for the BMP-1. All Malyutka-type missiles are compatible with the BMP-1's launcher system. 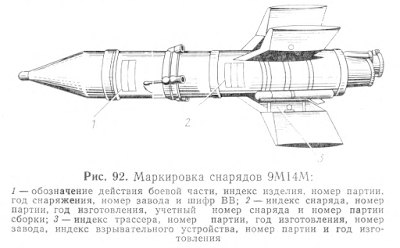 The Malyutka-M features an improved rocket engine for improved flight speed. The 2.6 kg warhead has a steel shaped charge liner. As such, it is not unusual for its 120mm warhead to have a limited penetration power of only 410mm RHA - a level of performance that the 73mm warhead of the PG-9N round already reaches. The propellant for the rocket engine is housed in a container in the center of the missile fuselage and the nozzles for the engine are placed at the front of the fuselage, behind the warhead. The warhead is a separate module that would only be attached during the preparation for firing in the case of the man-pack 9K11 missile system, but for the BMP-1, the missiles are stowed in their assembled form. 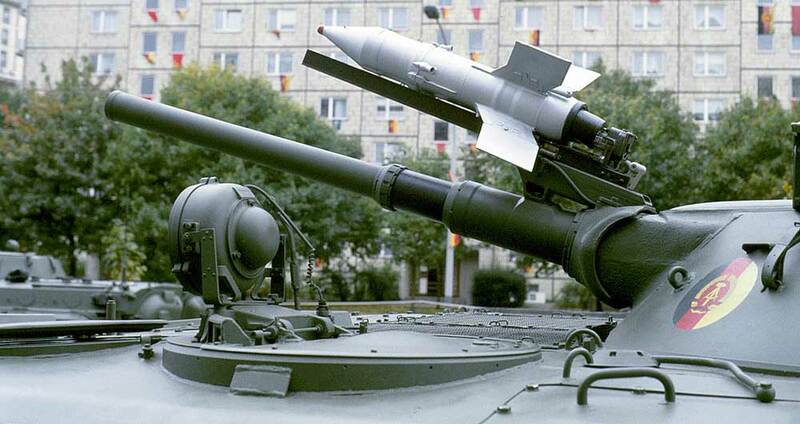 The missile could easily penetrate the thickest armour on any NATO tank preceding the Leopard 2 and the Abrams. SACLOS version of the Malyutka. Can only be used in MCLOS mode. Further improved SACLOS version of the "Malyutka" with a more powerful warhead. 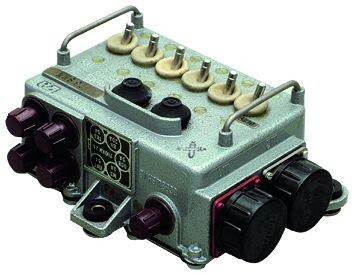 If used on the BMP-1, it can only be operated in the backup MCLOS mode. The Object 765 sp.4, better known as the BMP-1P, had its "Malyutka" missile system replaced with an externally mounted 9P135M launcher post. The joystick control box and the missile launch rail for the "Malyutka" system were removed in this modification. I will not write much about it here, as a highly detailed breakdown has already been published in the BMP-2 article. However, there are some unique points about the BMP-1P's missile configuration that ought to be understood. Firstly, the missile launcher is placed on the turret roof so it was still possible to assume a turret-down position when using the ATGM. 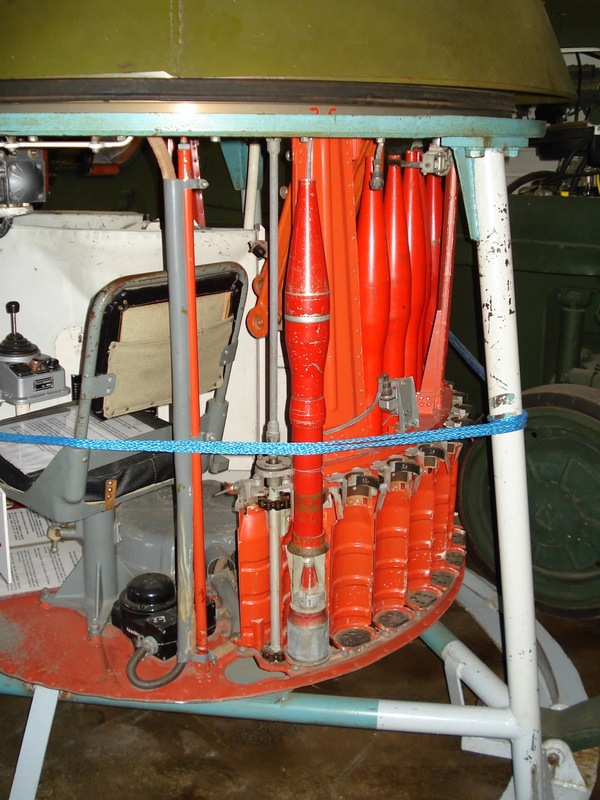 Unlike the "Malyutka" system, it is permitted to keep the launcher loaded with a missile during non-combat operations as the missile is housed in a protective fiberglass container. On the downside, the fact that the gunner is now stripped of the ability to fire missiles under armour is a serious drawback, and it is especially atrocious considering that the BMP-1 needs to be capable of operating in an NBC-contaminated environment around the clock. With nothing but a 6mm-thick hatch in front of him, it is less than safe to pop out to use the ATGM. There are certain advantages, certainly. For example, the gunner's view is obviously much improved outside the turret, so it is easier to find targets by eye. The placement of the launcher above the turret roof also presents certain advantages. The vehicle can be parked behind a pile of rubble, a hill, a mound, a wall, or even just a particularly large bush, and it will be possible to hide the entire silhouette and still use the vehicle's missile launcher. Still, these advantages are purely circumstantial. It would still be much better to have an under-armour missile launching capability, and preferably the ability to reload under armour too. Why did they do it this way? Why not mount several Fagot or Konkurs missile tubes externally on either side of the turret and just have the 9P135M periscope stick out the roof? We know for sure that it is not difficult to link multiple missile tubes or launchers to a single master control unit. That was what the 9V332 control box was for, after all. The missile operator in a BRDM-1 "Malyutka" tank destroyer could select and fire six "Malyutka" ATGMs remotely using a single control box. There seems to be no good explanation for why such a system was not implemented on the BMP-1P other than cost savings and expediency. Nevertheless, the situation with the BMP-1P is not so different than its contemporaries like the Marder 1. The Marder 1 did not even have an ATGM launching capability until it was modernized in 1977, and the upgrade only involved installing a simple launcher post beside the commander's hatch, identical in form and function to the one on the BMP-1P. Also, it should also be pointed out that only one Marder in a platoon of three vehicles was given this modification with a MILAN launching unit and the missiles to use with it. This was purely for doctrinal reasons. The Marder's turret has a two-man crew and it is the commander who operates the ATGM so technically the gunner is free to carry out other tasks as opposed to the one-man turret of the BMP-1, but technical limitations limit the gunner of a Marder in his abilities to contribute. He has no observation equipment save for his gunsight, and he cannot fire at anything, because the turret cannot be traversed as that would interrupt the commander. The AMX-10P faces a similar conundrum. Clearly, the simplistic implementation of anti-tank missiles on most of the modern IFVs of the time was a global trend that the BMP-1P simply followed. It is no better or worse than its contemporaries in this regard. The exact number of BMP-1 and BMP-1Ps that received "Tucha" is unknown. Examples that received the upgrade were not specially designated as far as I know, except perhaps for the factory code. The addition of the "Tucha" system actually involves more work than the installation of the external missile launcher on the BMP-1P. as "Tucha" connects to the vehicle's electrical system and has its own control box. This means that the old master control panel used to power up anciliary systems had to be replaced with an updated one. A bank of six 81mm smoke grenade launchers are arranged around the rear of the turret, aimed in a forward arc. One modernization path for the BMP-1 is the BMP-1-30. The possibility of modernizing BMP-1s to this new standard was obviously explored, but it appears that it was never adopted. Needless to say, this modification is an extremely sensible one. With so many outdated BMP-1s stuck in storage, such an upgrade might make them viable for serious frontline service. Outstanding article! It was worth the wait. That's why I won't be doing any more of these for the foreseeable future. An even better upgrade would be to use the Bereg turret - essentially the same as the BMP-1-30, but with advanced sights and Kornet ATGMs. P.S. : You should do an article on BMP-1 modernization options. I'm afraid that I won't be keeping up the "good job", anonymous. Reality is knocking on my door, and I have to answer it. I won't be writing for Tankograd any time soon. I will still correct errors if readers find them, though. Despite a "Field disassembly" article, it is highly detailed and informative! Great job! As for the hit probability of the weapons in the hungarian army... Well, that is a shameful story. Our infantry was especially poorly trained amongst WP states. Since BMPs belonged to MRDs, the results were horrible. 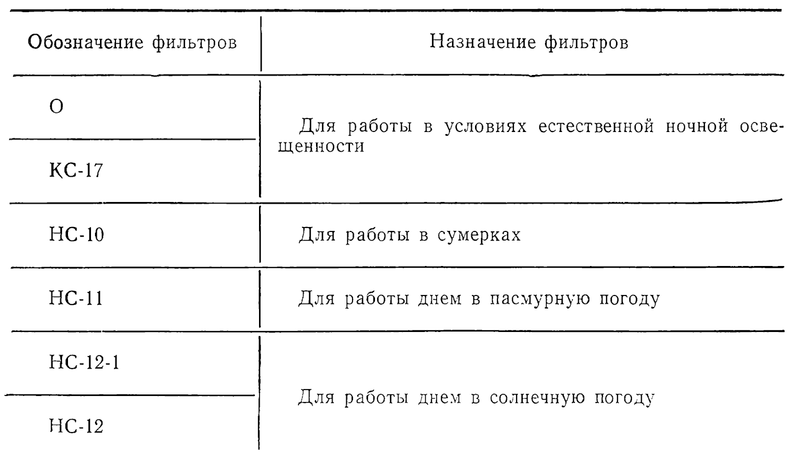 Gunners had little experience with the gun, and almost none with the Malyutka. One unit managed to achieve only 20% accuracy with the ATGM. Another unit cheated on the exercises: They "imported" tank destroyer crews (9P133), who were far better trained, so the unit commander avoided shame... After some scandals, training of BMP crews improved. They were now able to achieve 70+% hit probability with gun @ 500m against moving target (2x2m), and 85+% with Malyutka (range unknown). If conditions were ideal, no wind and stationary target, the hit probability was at least 95% @ 500m. The 2000 simulated shots were applied to tank destroyer crews, not for BMP, they werent even allowed to touch the real thing before this 2000 shots. That's very interesting stuff. I must do more research! An absolutely fantastic article. It's quality was as good as always, the BMP-1 is a widely known vehicle but so little in detail is known to us common folk. The wait was worth it. Thanks, Nick. And thanks for the consistently positive commentary! We have a very nice little community, don't we? A very nice community indeed. Have you thought of getting a Patreon Account? With that, us the readers could supply you a few bucks a month to or a lot depending on our pocket book sizes for writing articles here. I would shell out a few bucks a month for your excellent articles. 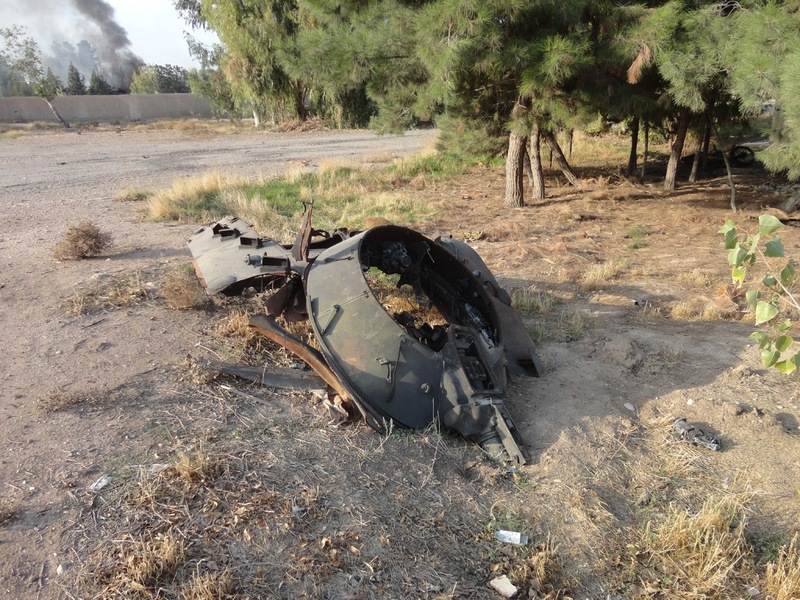 Did BMP crews use the Coax as well to determine range? I recall reading accounts of WW2 Tank Crews doing that, and I wonder did sights improve enough that that was no longer necessary, or did gunner get enough mathematics training to rapidly calculate all the variables and engage? Hi again, Golladay. Yes, I was thinking of Patreon, too, and I have some plans to use the money to get translators and pay commissions to authors. I posted a few paragraphs on that in the 'Announcements' page. The tab for 'Announcements' is just beside the 'Home' tab. Unfortunately, I cannot give a direct answer to your question, because I have never come across primary sources (soldiers' journals) mentioning it. As far as I know, BMP gunners preferred to conduct fire adjustment the usual way - by observing the impacts of their previous shots. It is definitely possible that some gunners used the coax as a rangefinder, but they probably did it unconsciously. In Chechnya, for instance, a BMP gunner may rake a window suspected to host an enemy sniper out of instinct. In doing so, he can know the range to the window, but it would be inadvertent. You probably already know this, but just to be safe; coax ranging is possible in any fighting vehicle, but it is not very effective without special ranging ammo. Regular 7.62x54mm B-32 ammo has a small incendiary filling at the tip, so there's some flash when it strikes hard targets, but it's not obvious enough at long distances. This is why larger bullets, like .50 BMG, are used in ranging guns and not 7.62mm. 7.62mm flashes can be spotted at several hundred meters' distance, but at such short range, ranging may not be needed at all. As you might remember, PG-9 and PG-15 rocket grenades have a very flat trajectory at short range. Gunners were trained to use the markings on their sights and the stadia rangefinder, but that was it. "Another big plus was that the BTR-60PB and BTR-70 were both armed with a high elevation 14.5mm machine gun ideal for mountainous warfare"
Actually, the turret on the BTR-60/70 also had a relatively small range of elevation, limited to only +30°. These vehicles received similar criticism to the BMP-1 in their inability to engage targets in mountainous terrain. It was not until the advent of the BTR-80, which featured a revised gun mounting, prompted by Afghan experience. "All BMP-1s still in use today are armed with PG-15VN rockets, though it doesn't really mean much, as most modern armoured fighting vehicles are more or less immune to them." This is something of an exaggeration; the PG-15VN is simply ineffective in the frontal aspect, against main battle tanks. Against the rear, or in some cases, sides of even modern MBTs, the PG-15 should still be adequate to penetrate the thinner armor of MBTs in these areas (unless ERA is deployed), in the same fashion as other IFVs armed with larger calibre autocannon. Furthermore, other AFVs, including many IFVs, are still highly vulnerable to this weapon; there is no reason to assume that legacy vehicles still in widespread service, such as the M2 Bradley or CV-90, have sufficient protection in any aspect to resist PG-15 fire, to say nothing of even thinner skinned vehicles such as the Stryker / LAV III. As an additional note, if you write further articles of this length, you may wish to adopt a standardized citation style (e.g APA, Chicago, MLA) for your references. I'm hardly a stickler for this in most online writing, but for a piece of this length and sophistication, adopting a standardized style could help the article flow more smoothly, and assist readers in locating sources in the future if links go dead. [prompted by Afghan experience] ...that greater elevation capacity was added. I apologize for the mistake. You are absolutely correct on the first point. The offending statement has been removed. On the second point: My pessimistic assessment of the PG-15VN does not take rear shots into consideration, for obvious reasons. The sides of some MBTs may be dangerously vulnerable, certainly, (the Leopard 2 comes to mind), but this is why I did not build my statement on absolute terms. Some MBTs may be vulnerable, yes, but the majority of them are more or less immune, with emphasis on "more or less". Plus, the chances of scoring a meaningful hit drop abysmally when ERA is involved. I agree that old Bradleys and Marders are completely vulnerable to the PG-15VN, but as the modern updates of these IFVs can be given a coat of reactive armour at will, the BMP-1 is largely alone in its anachronism. I feel the same way about the citation system. I am fully aware that it is rather amateurish in its current form, and I intend to upgrade to Harvard style referencing in future articles. Existing articles may be overhauled as well, but I can't promise anything. I really appreciate readers with an eye for detail like you. Thanks for taking the time to read the article in its entirety and thanks for composing a very constructive comment! Thank you a lot for this, your site is such a wonder of information. Can someone clarify on the engine--are the designations UTD-20, 5D20, and 3TD all for the same engine? Also, does the Baz-5937 chassis (SA-8 Gecko SAM) use the same engine as BMP-1? They are all the based on the basic UTD-20 but modified for different applications, so all three are physically distinct from one another in some way. The UTD-20 and 5D20 are almost identical, but 5D20 has a different cooling system and different ventilation system built into the metal of the engine itself, so it is not interchangeable with the UTD-20 between the vehicles that they were designed for. 3D20 is a heavily modified variant of the UTD-20 for marine applications and is optimized for propellers and water jets and that kind of stuff, so it runs in a much narrower range of revs, has different cooling system, etc. The BAZ-5937 uses a modification of the 5D20 called the 5D20B-300. It's a bit more powerful (300 hp). There are other differences, of course, but only a mechanic needs to know them. I hope this is helpful to you. What is the weight of the BMP-1 turret, loaded/unloaded? PG-15VNT tandem warhead HEAT from Bulgaria should still make BMP-1 a danger to other IFVs, and side/rear of even many modern MBTs. Possibly, but the main constraint is the archaic aiming devices. There would probably never be a situation where a standard BMP-1 will ever get the chance to fire the first shot at a modern IFV or MBT at the effective range of the "Grom".